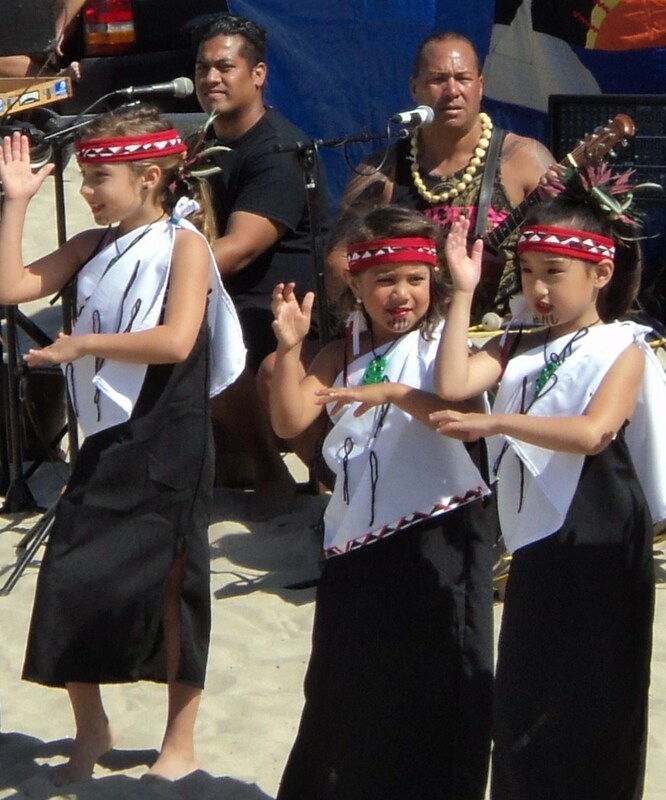 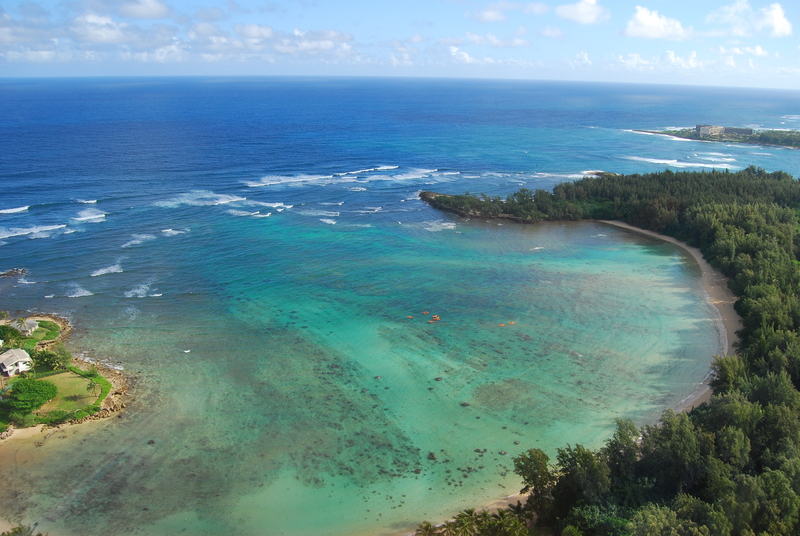 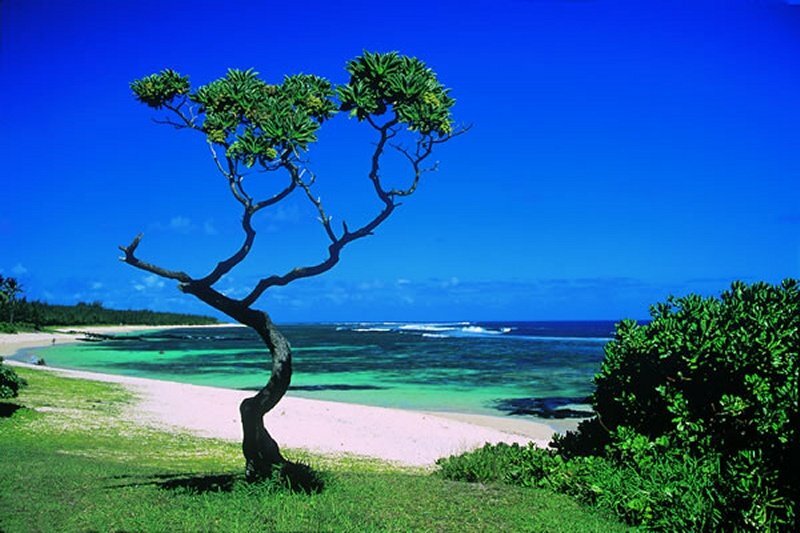 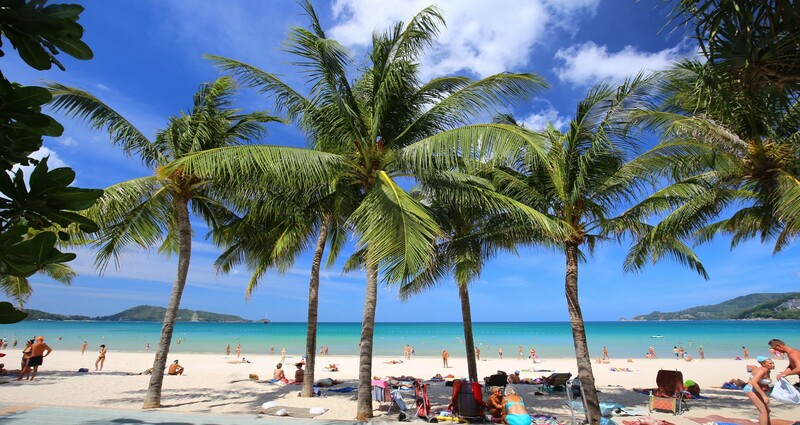 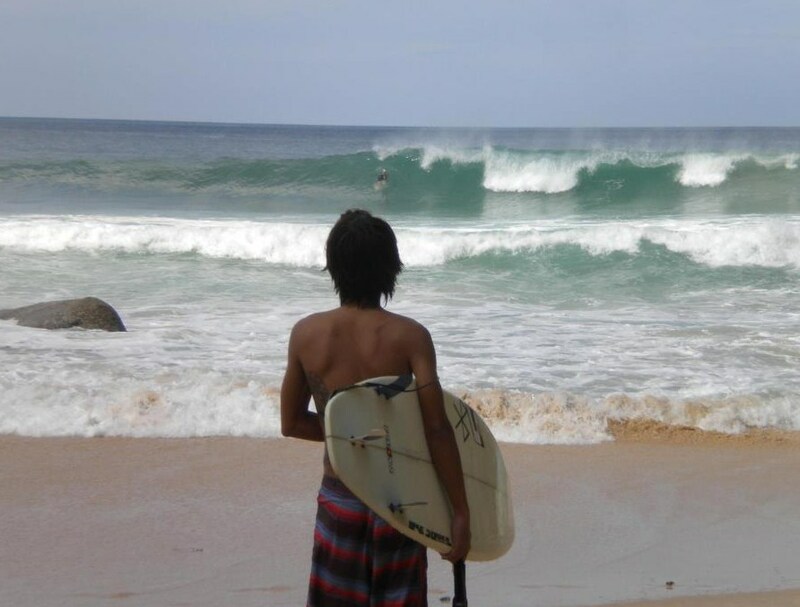 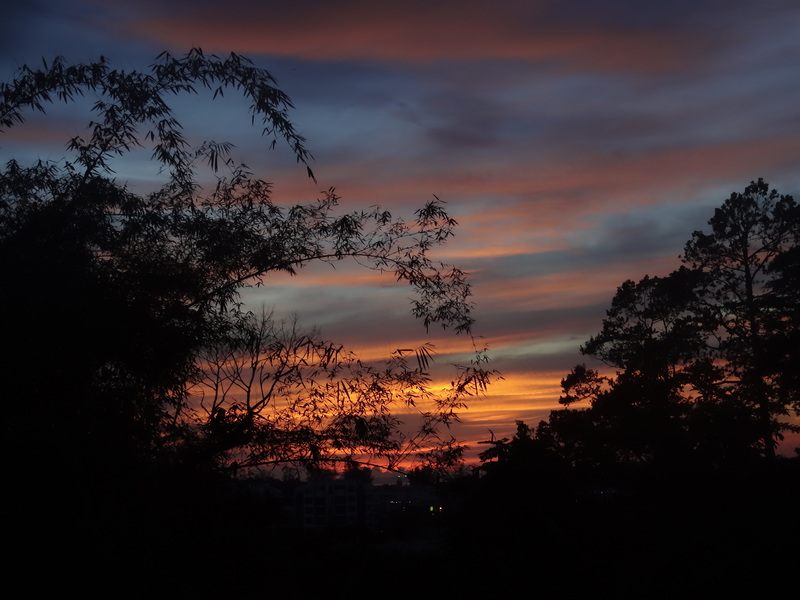 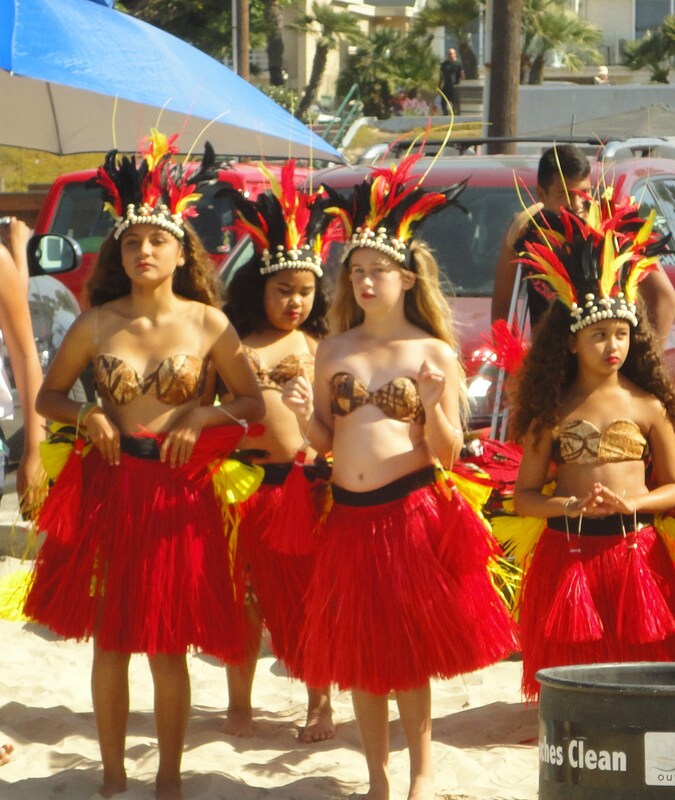 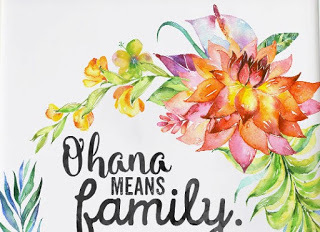 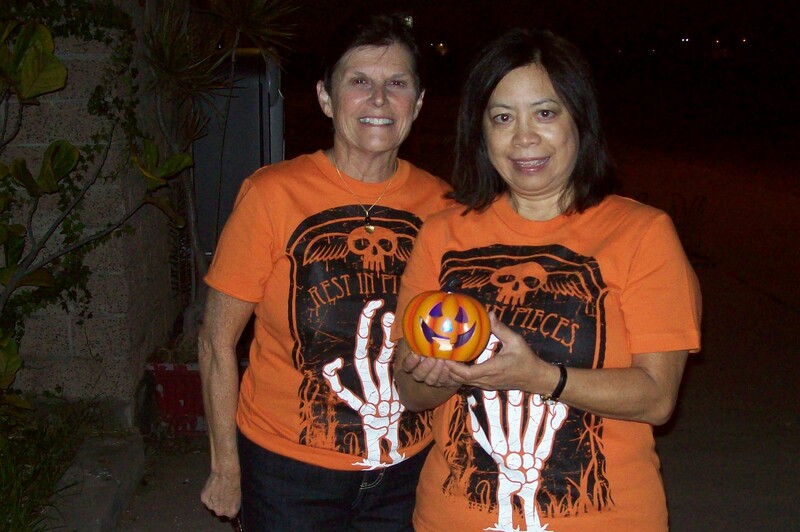 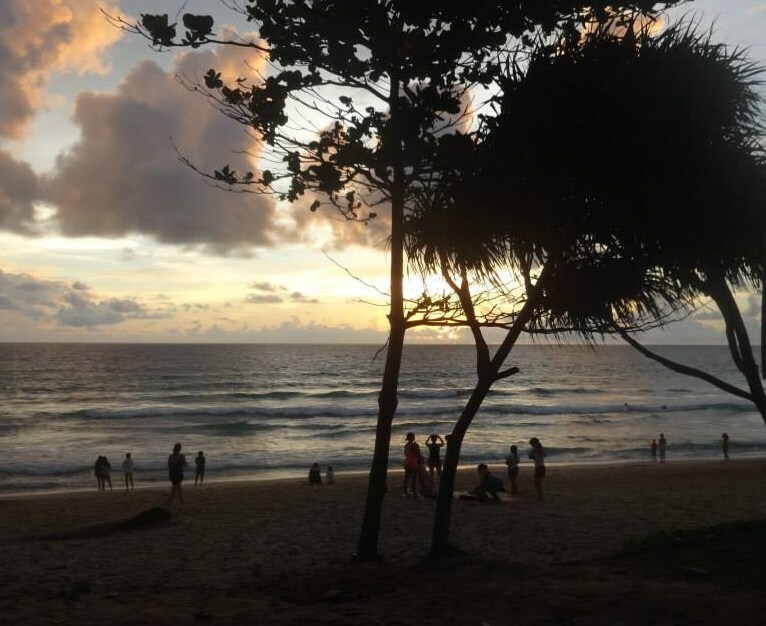 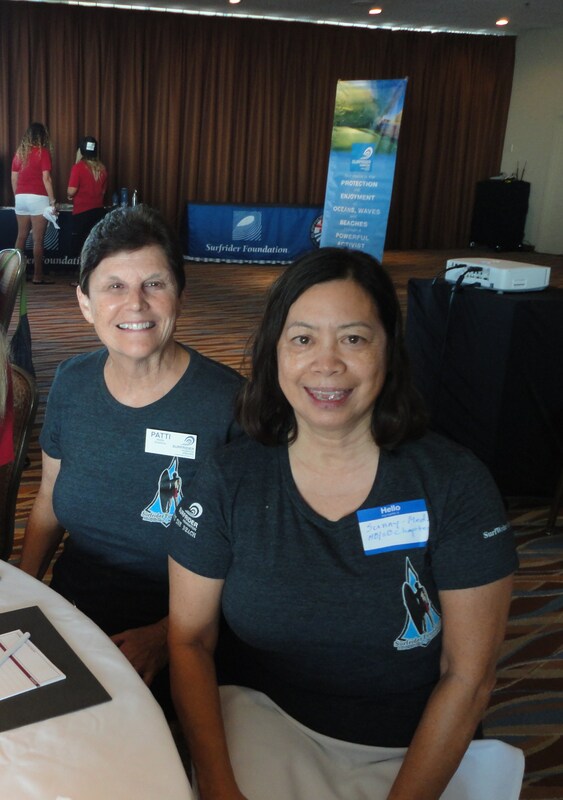 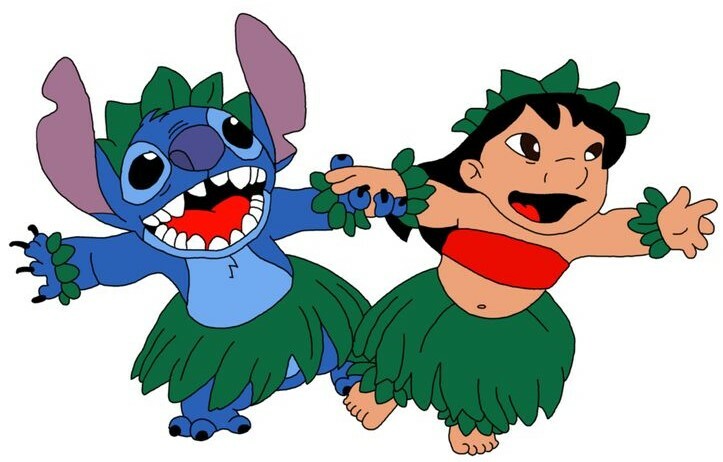 When the month of April is here SurfWriter Girls Sunny Magdaug and Patti Kishel always look forward to Ohana Day – a festive, Hawaiian-style celebration that brings family and friends to the beach to relax and learn about the earth…especially the ocean. 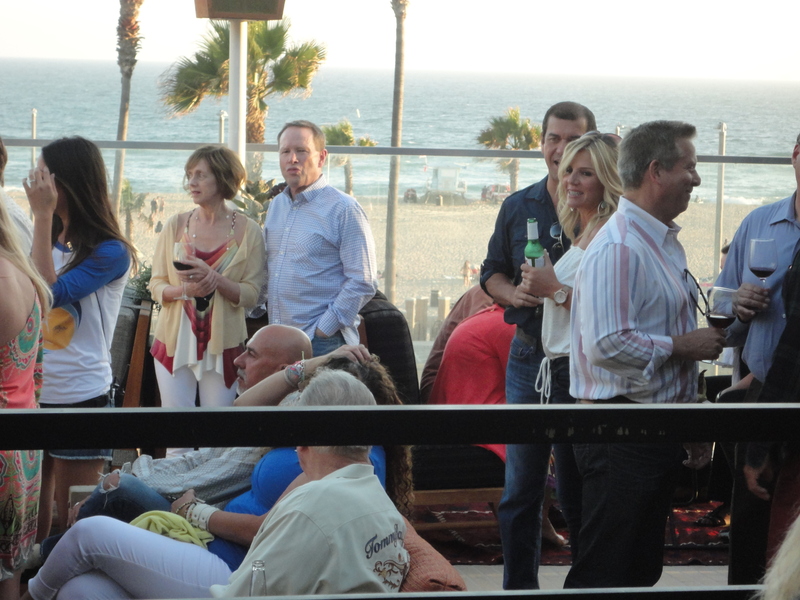 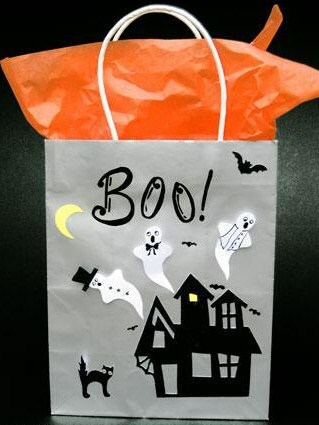 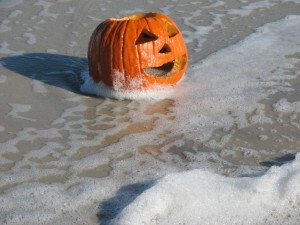 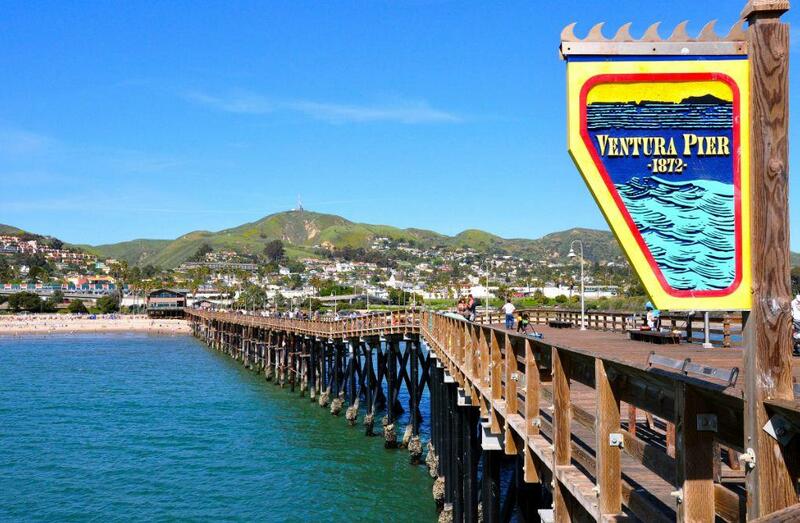 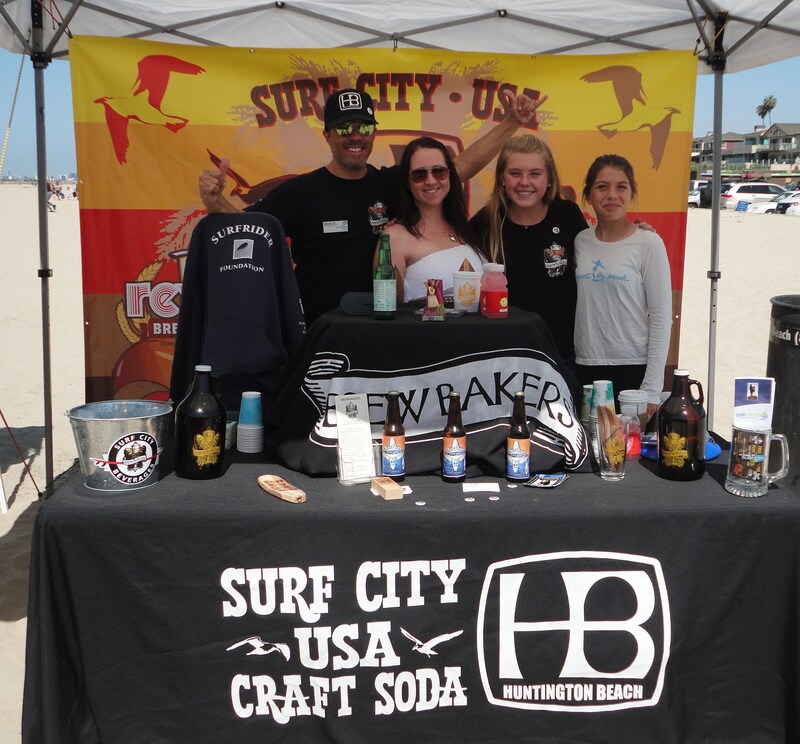 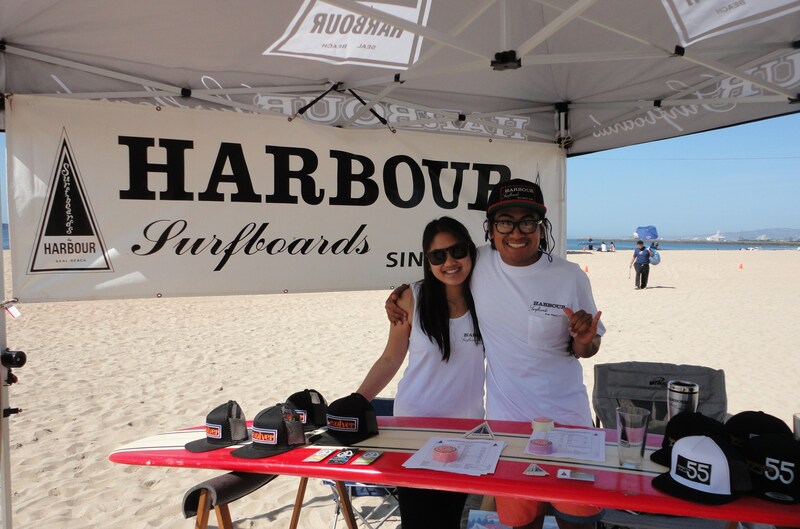 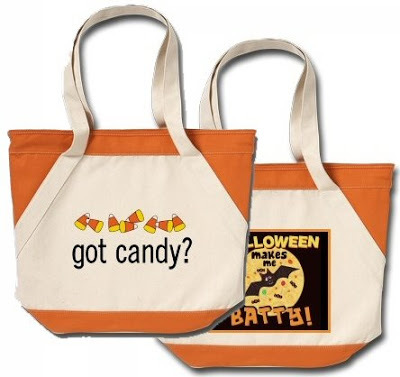 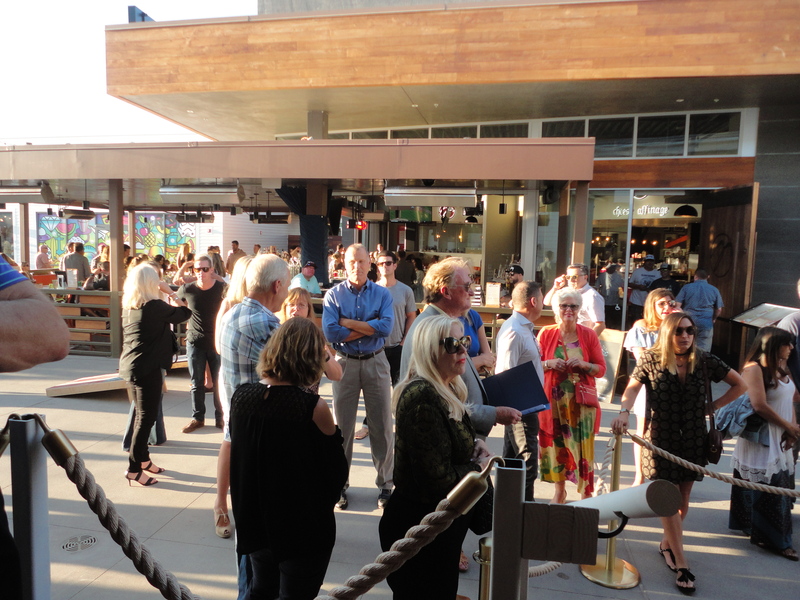 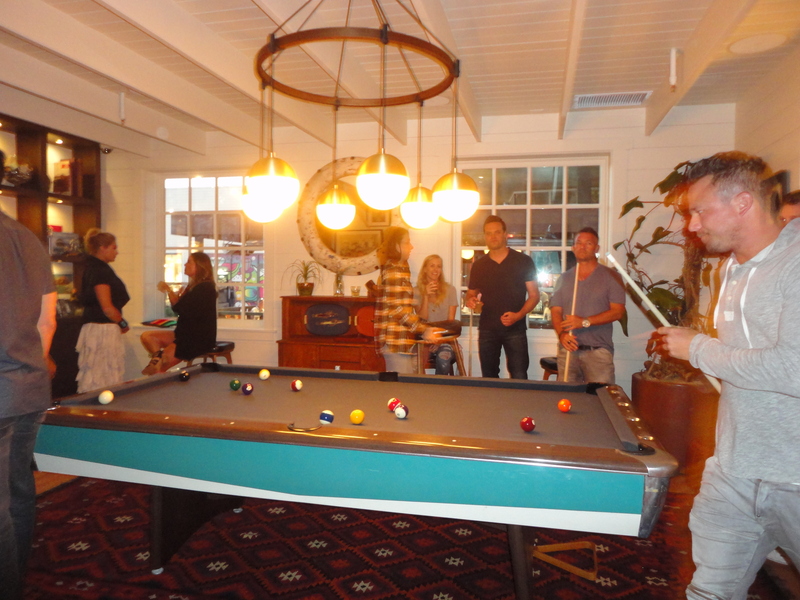 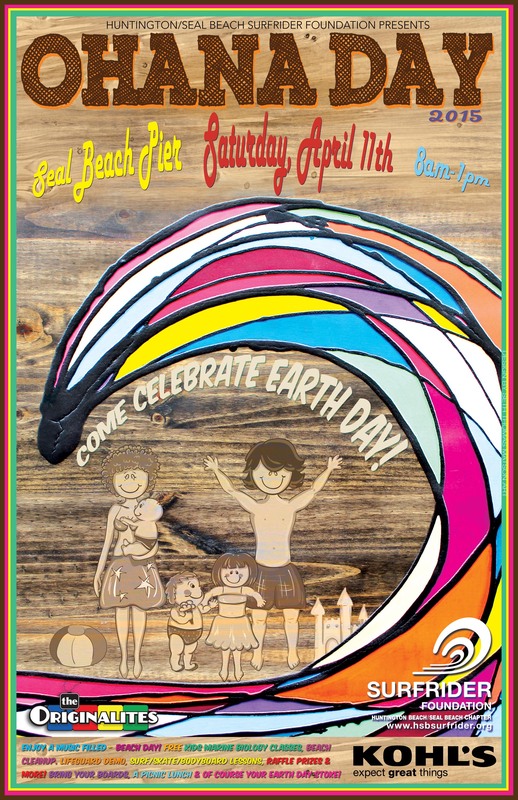 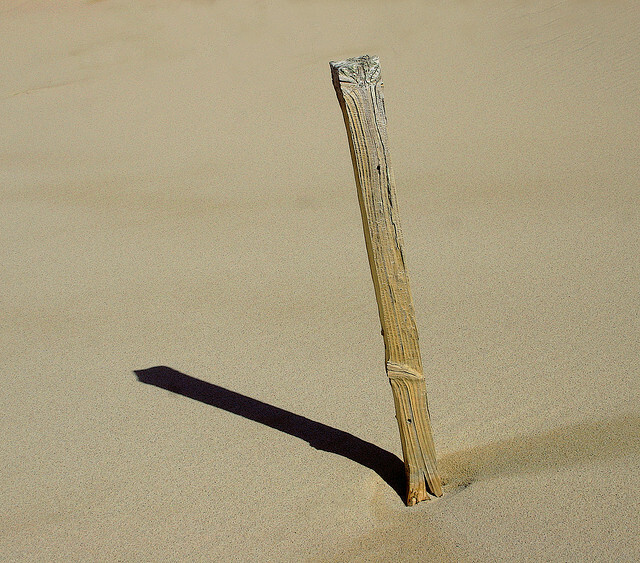 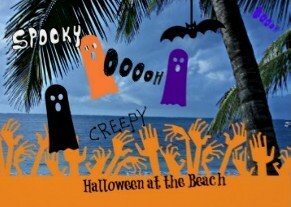 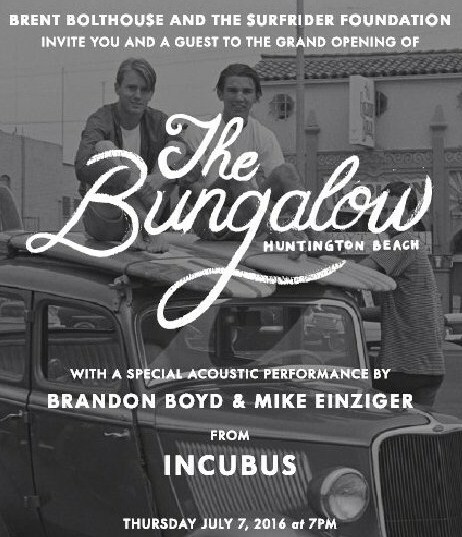 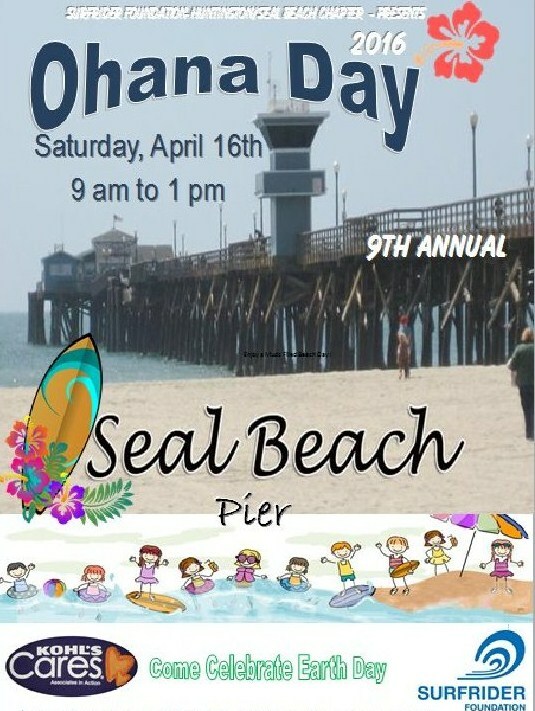 To join in the fun, head out to Seal Beach on April 16. 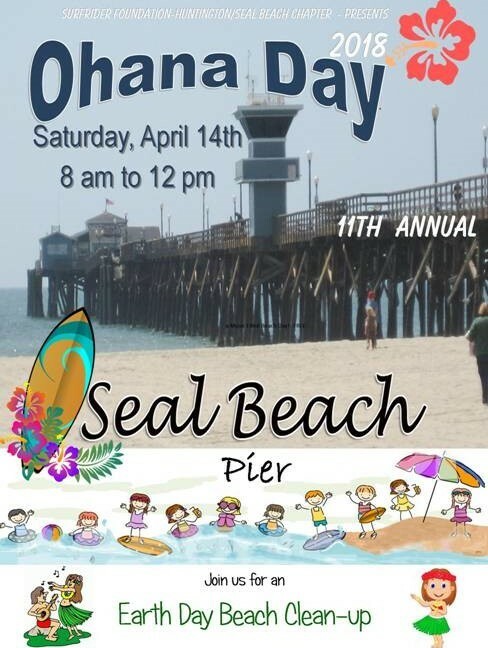 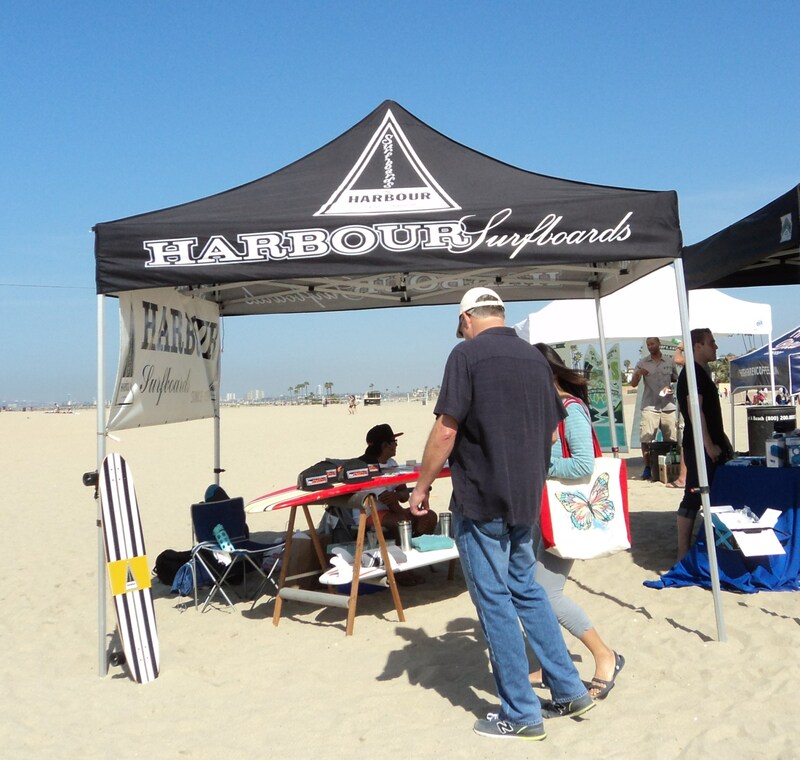 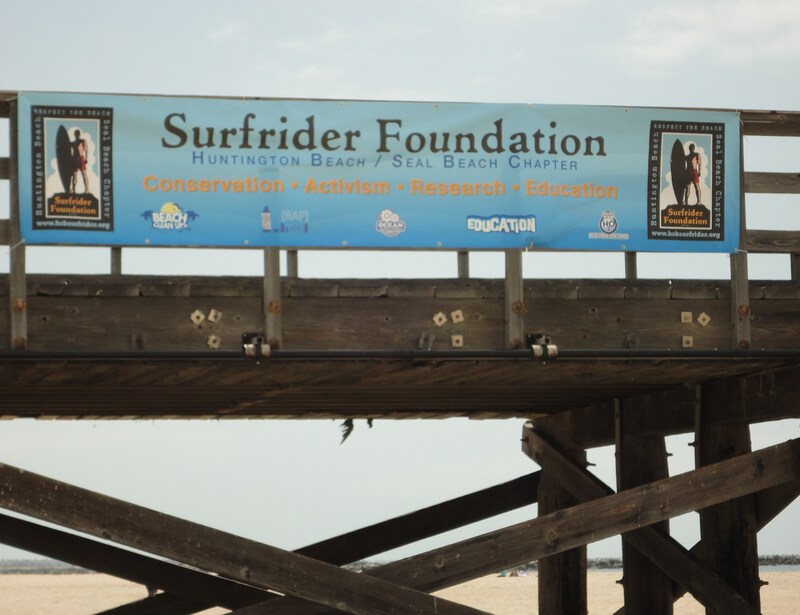 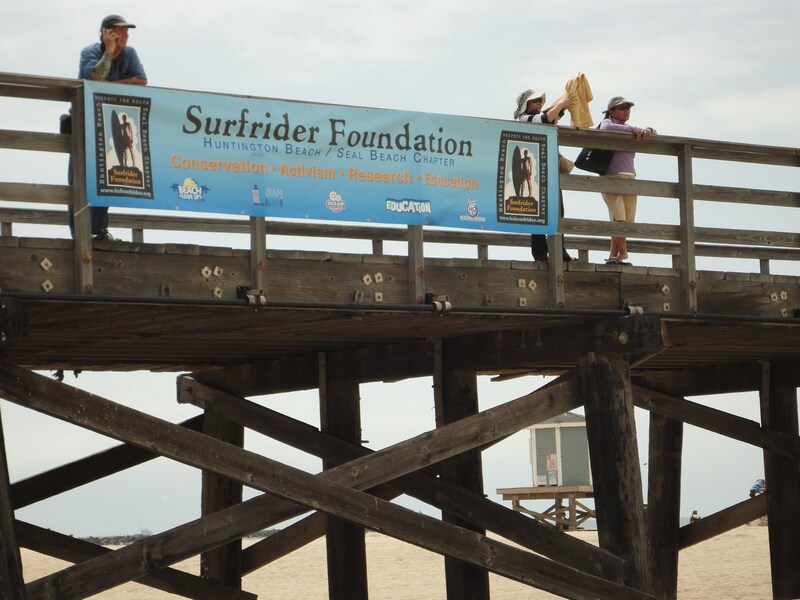 From 9 am – 1 pm the Surfrider Foundation Huntington/Seal Beach Chapter is hosting an Ohana Family Beach Day at the Seal Beach Pier. 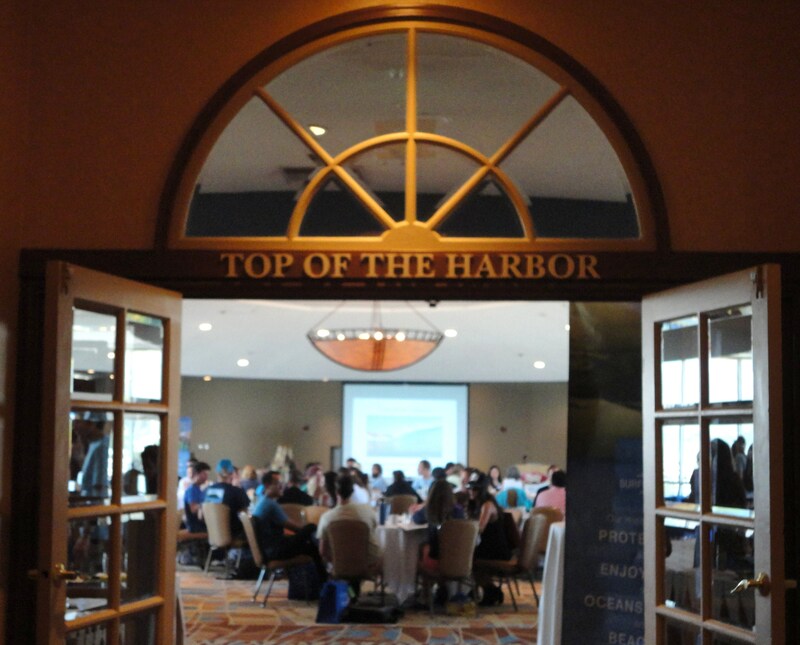 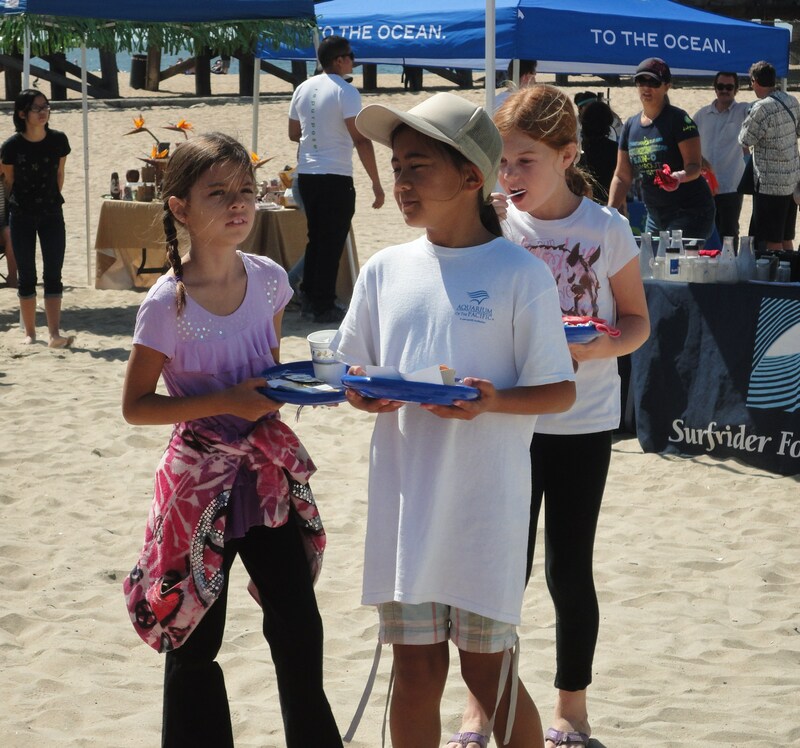 to enjoy hands-on activities, marine biology instruction, lifeguard demos, surf /skate/body board lessons, music, raffle drawings, and more. 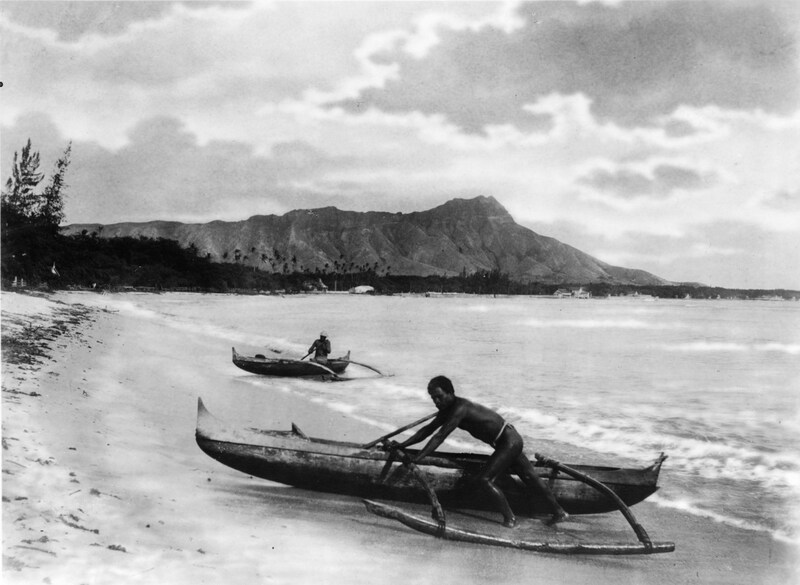 SurfWriter Girls learned that it was the spirit of Ohana – the belief that “we are all related to each other” – that emboldened the early Polynesian seafarers to make their long, migratory journeys in outrigger canoes to the Hawaiian Islands in 200 A.D.
Likening themselves to the shoots of the taro plant, which come from a common bulb (oha), the Polynesians felt that we are all connected – one family (Ohana) – and must work together, taking care of each other, and honoring the land that nurtures us all. 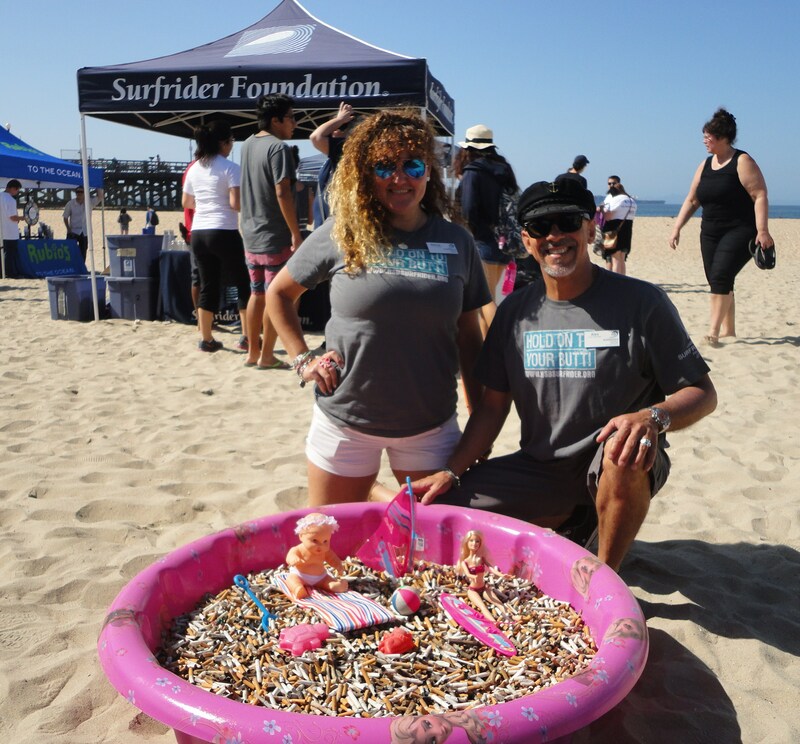 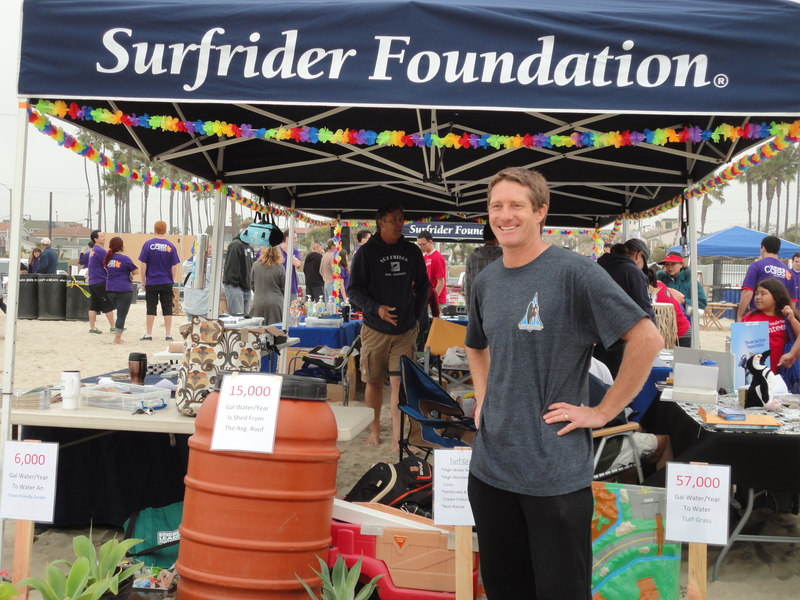 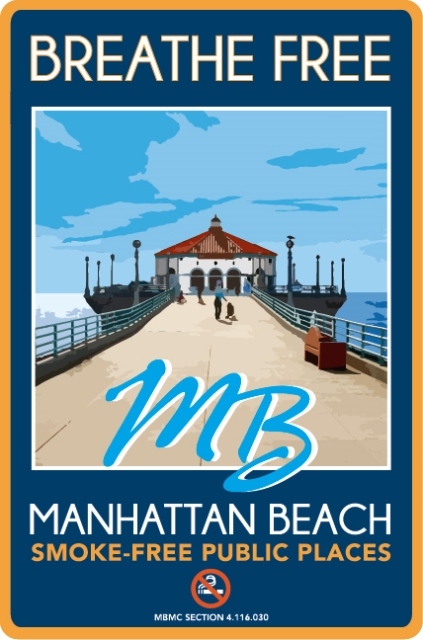 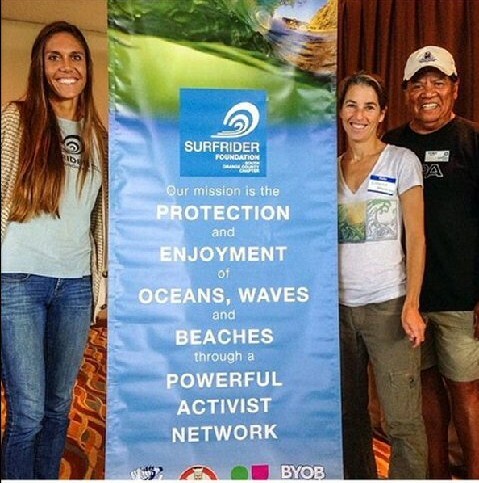 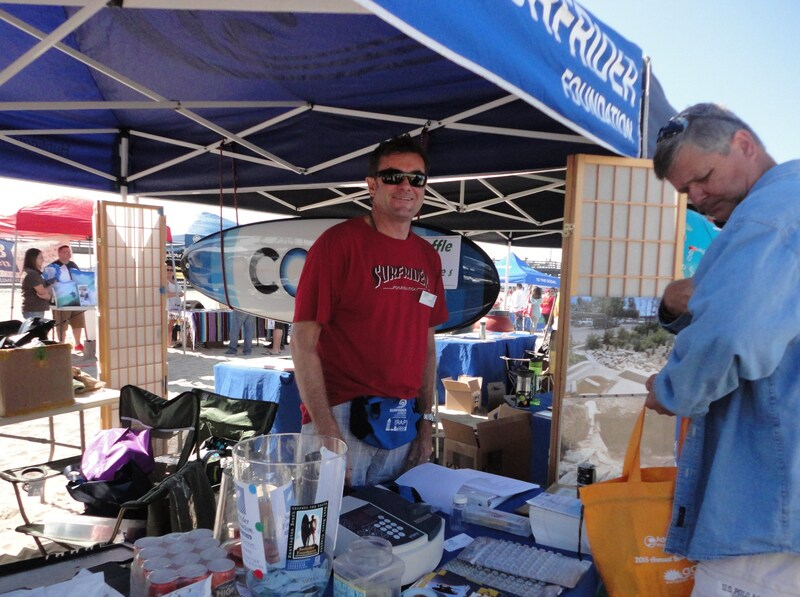 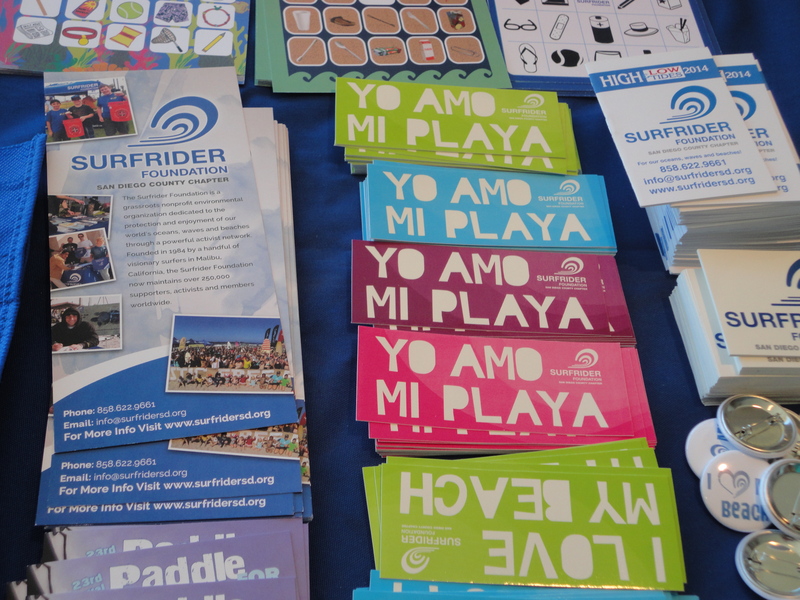 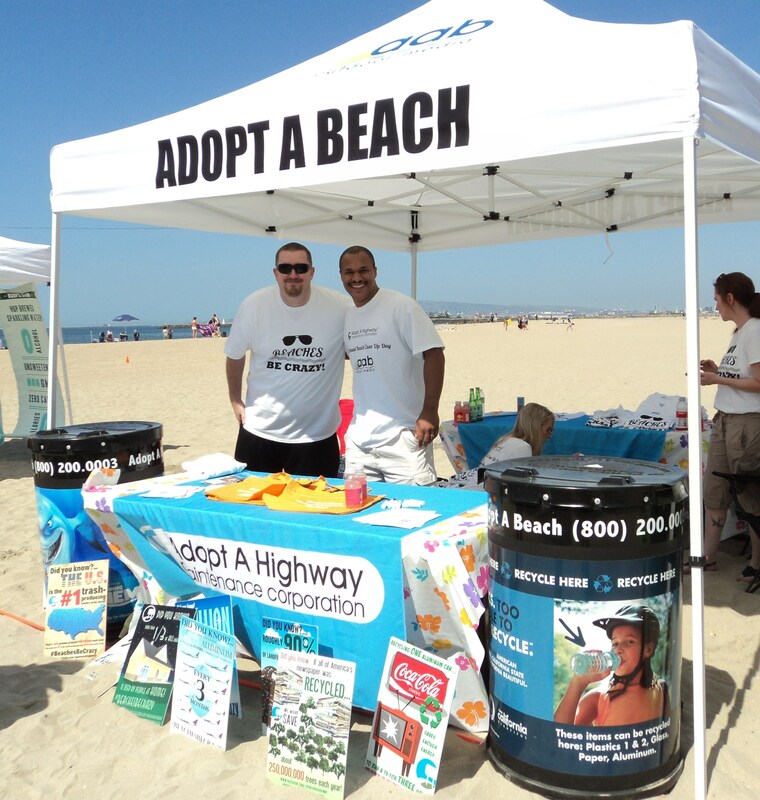 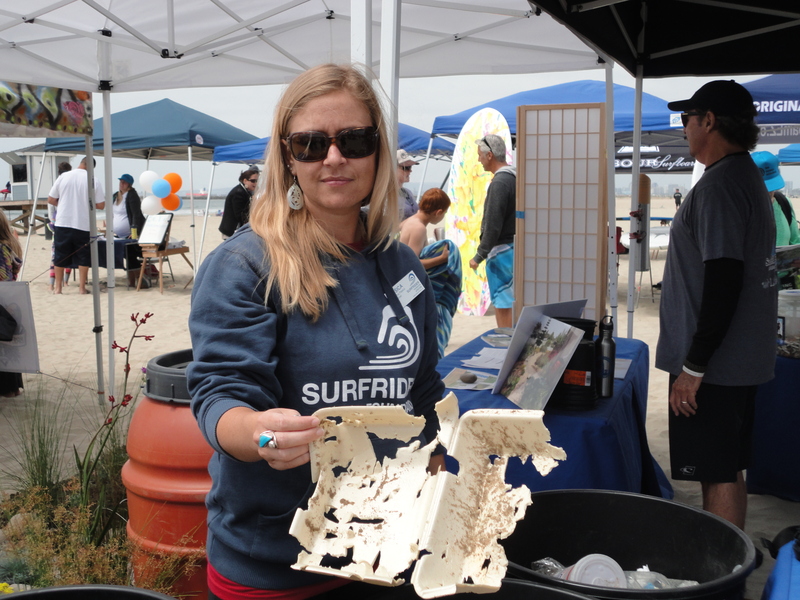 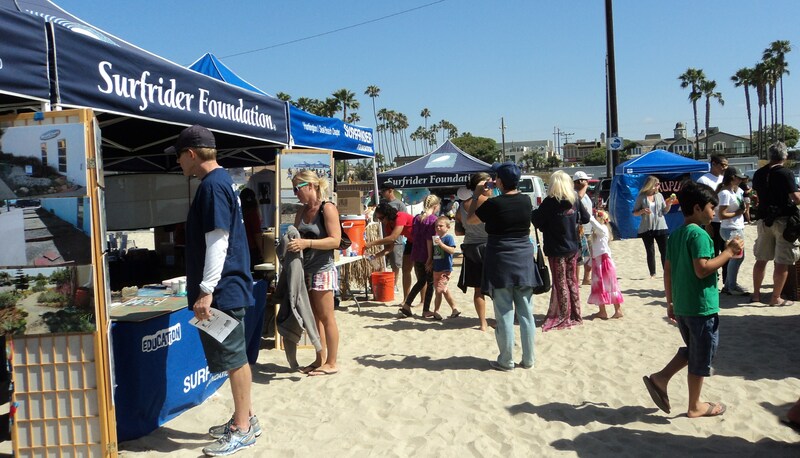 Surfrider volunteers will be on hand manning display booths, talking about ocean and coastal environmental programs and leading beach cleanups. 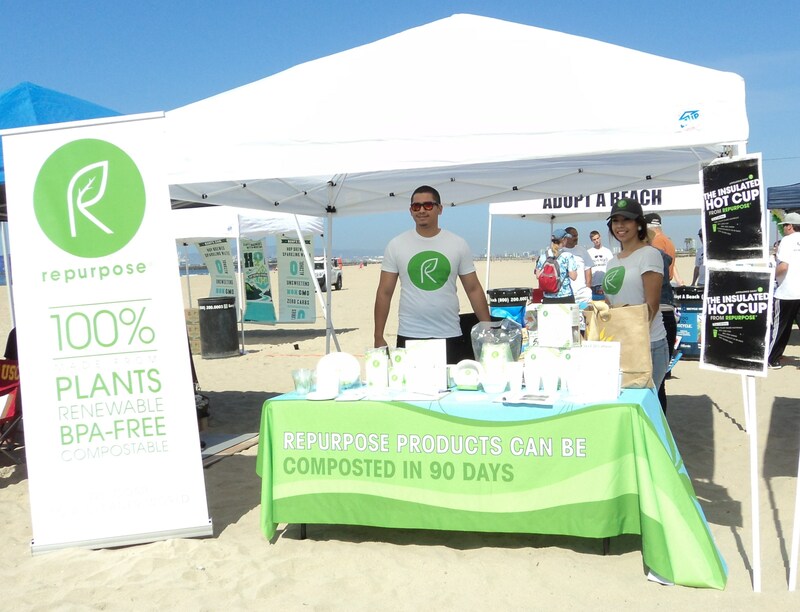 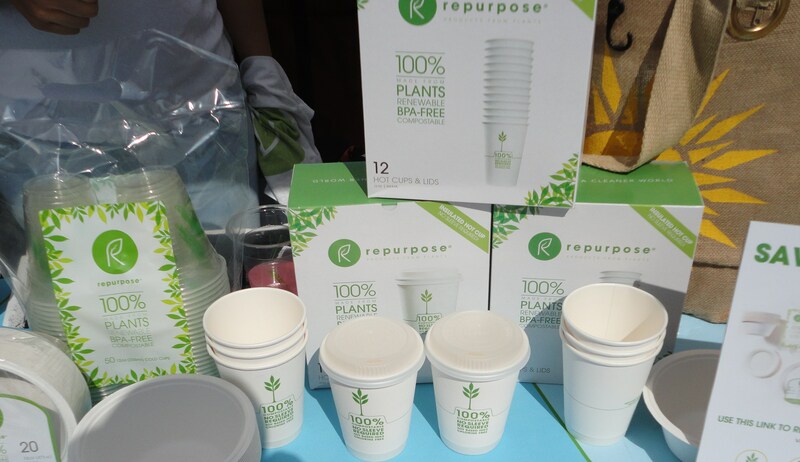 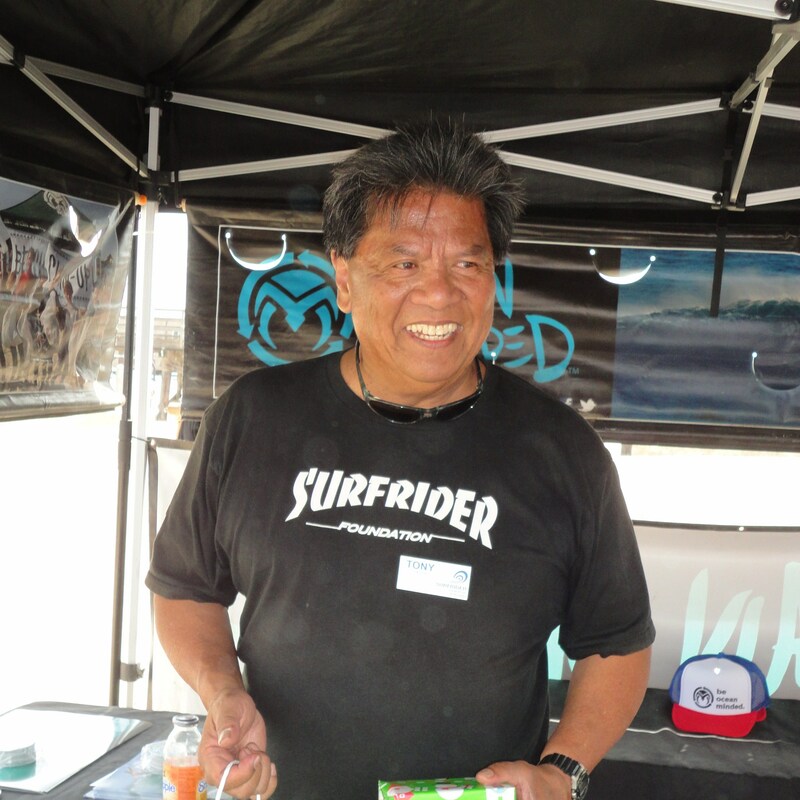 Businesses and organizations are sharing in the Ohana spirit, too, showcasing eco-friendly products and services and giving out samples. 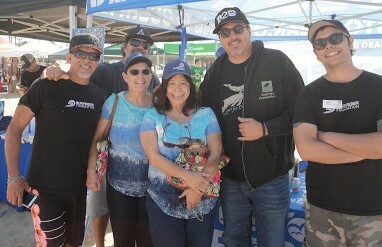 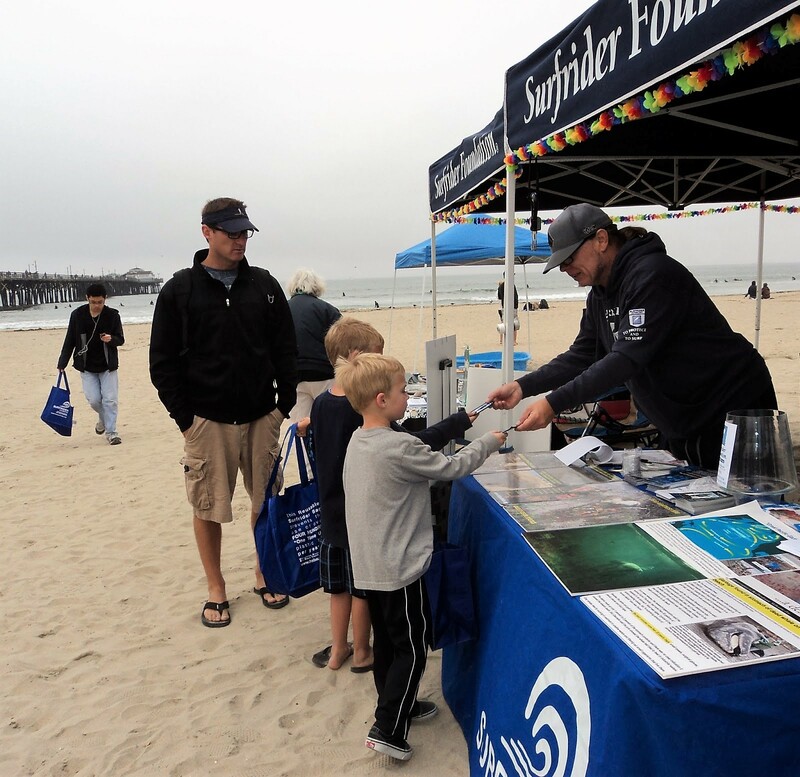 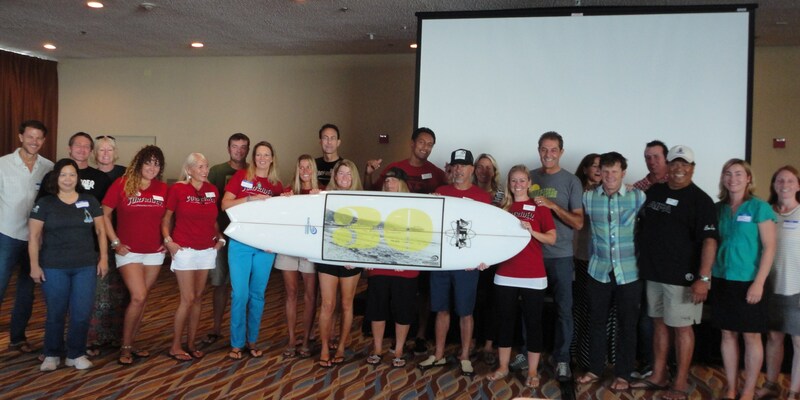 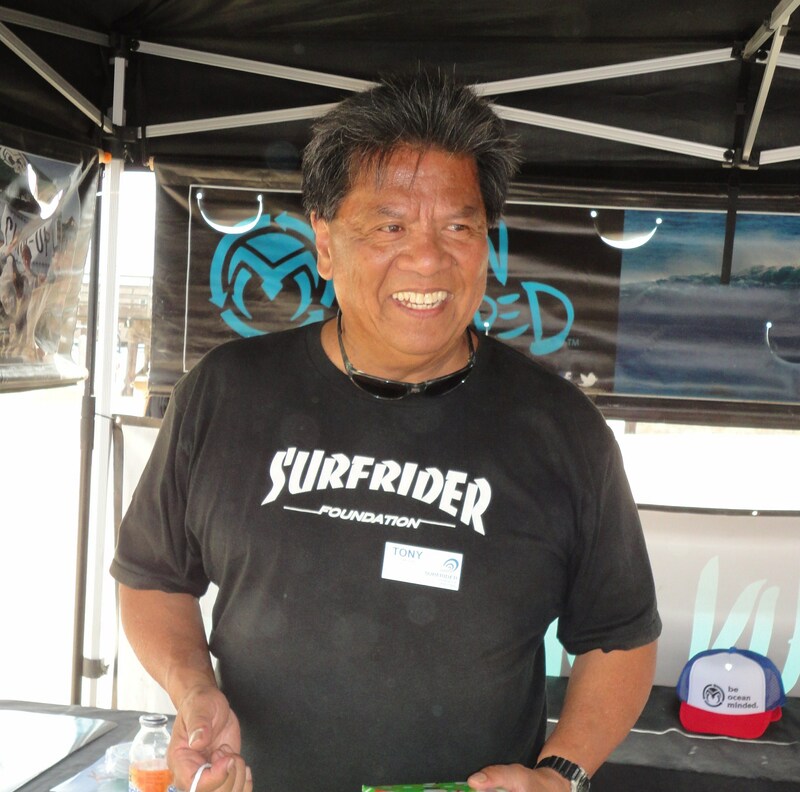 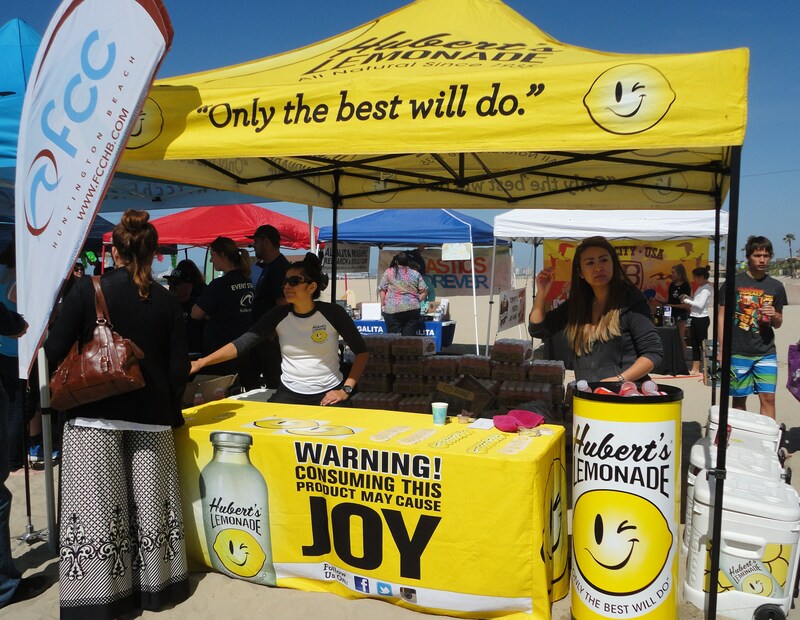 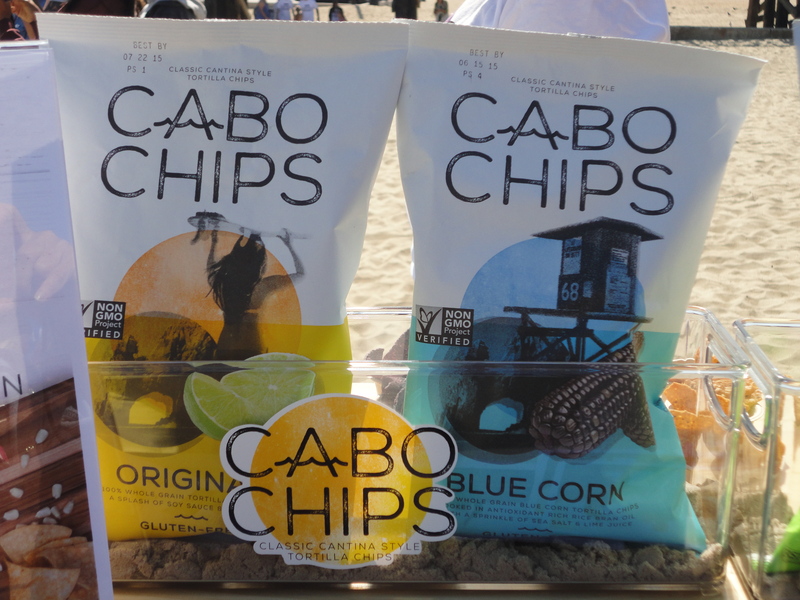 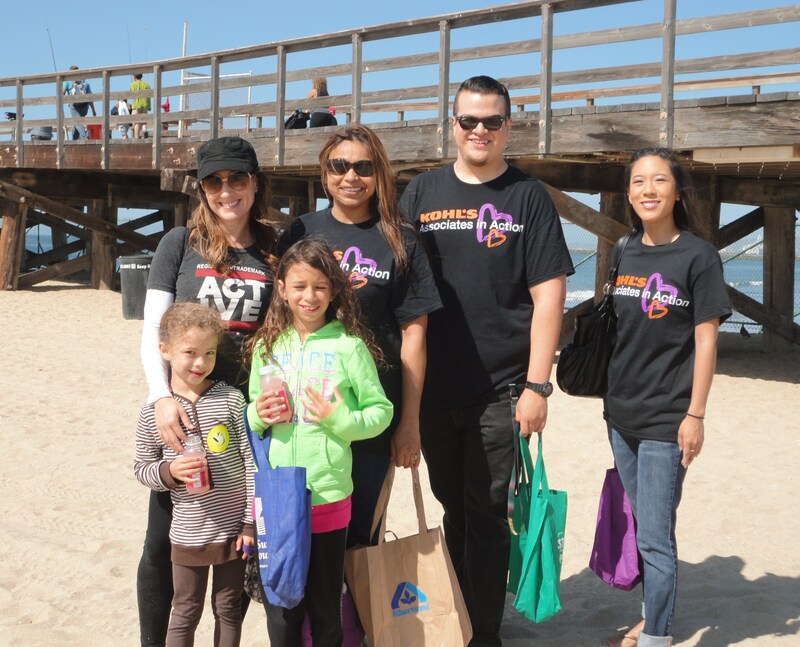 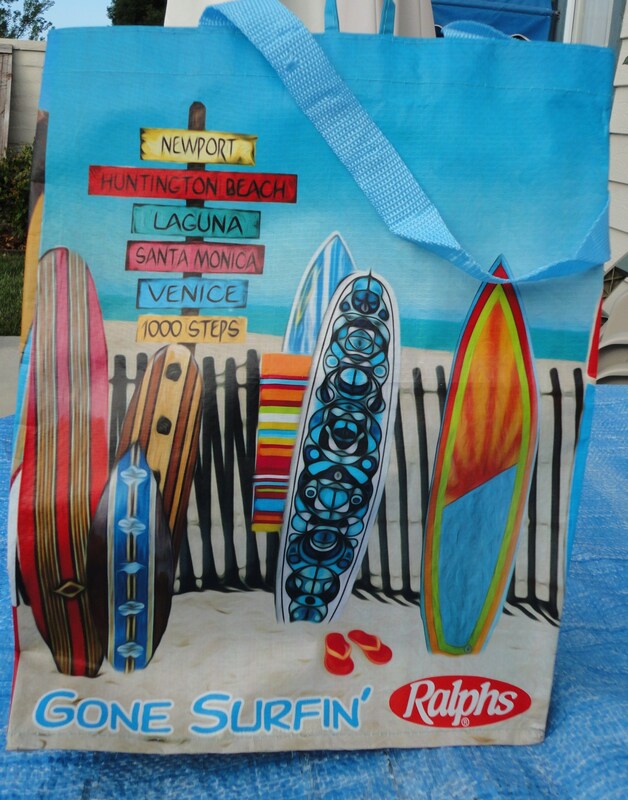 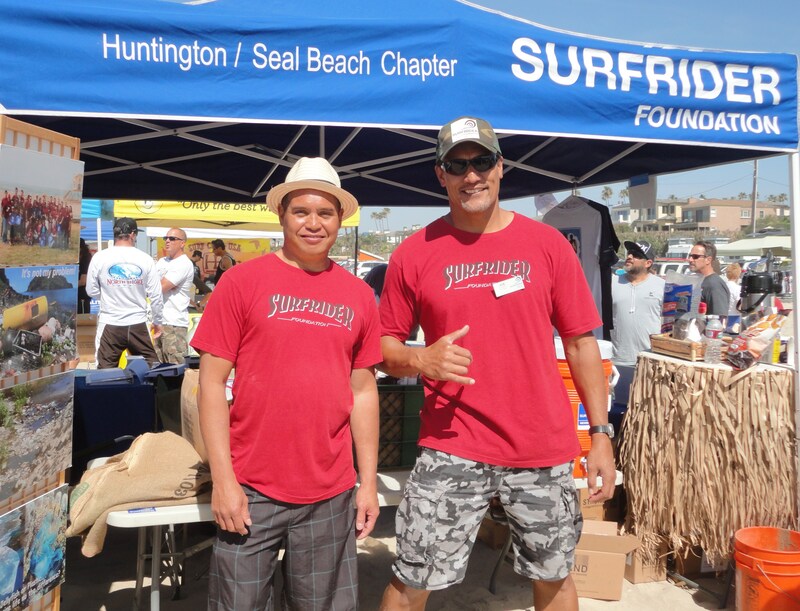 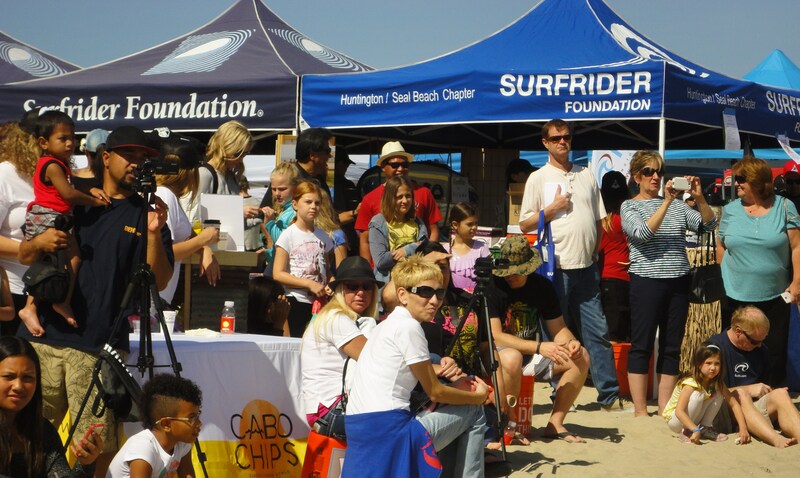 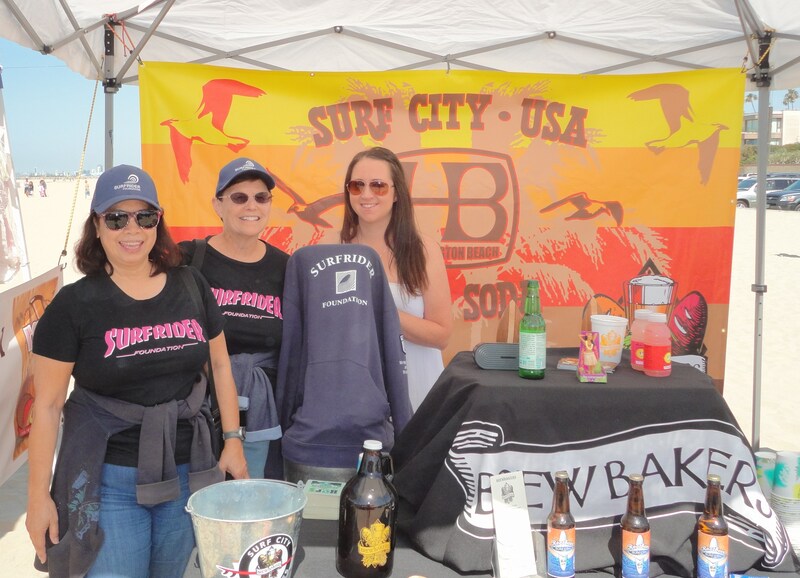 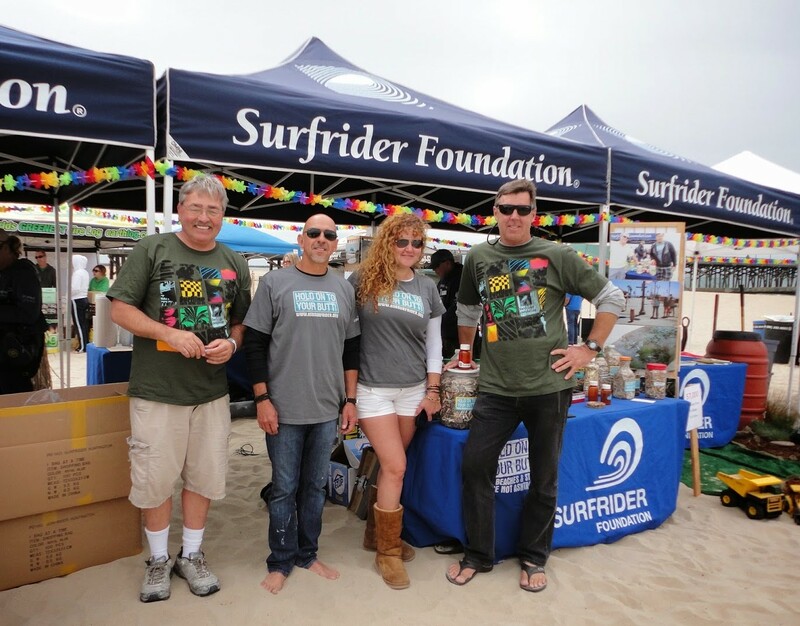 The Surfrider Foundation Huntington/Seal Beach Chapter and co-sponsor Kohl’s hosted the annual Ohana (Family) Day celebration Saturday, April 11, at the Seal Beach Pier. 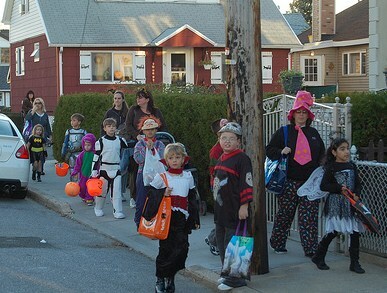 Friends and neighbors turned out in force to join in the festivities. 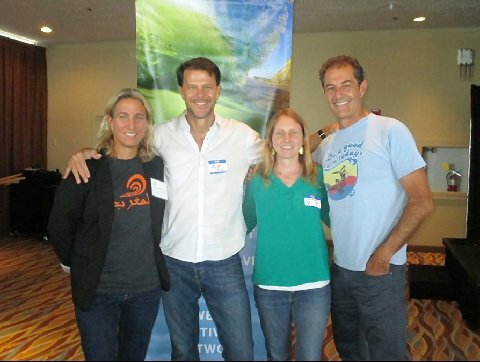 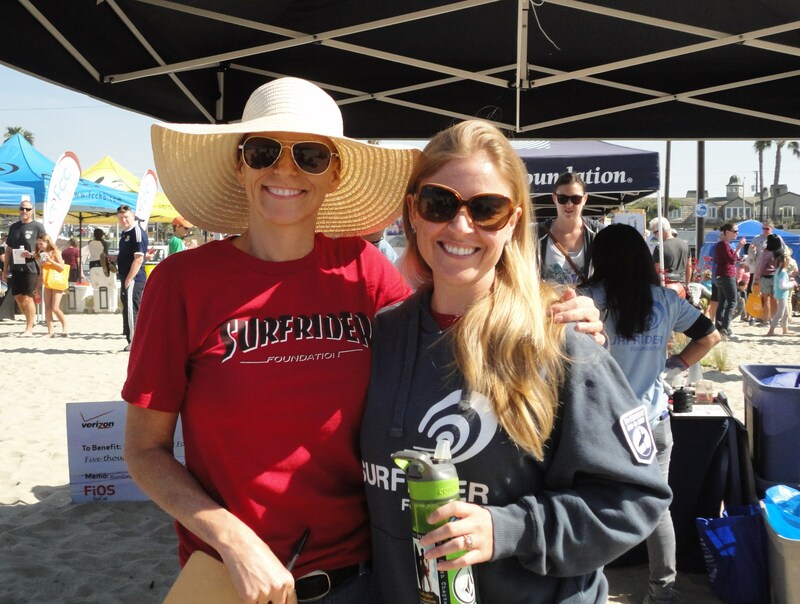 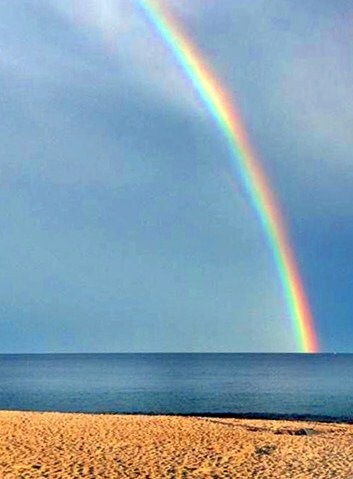 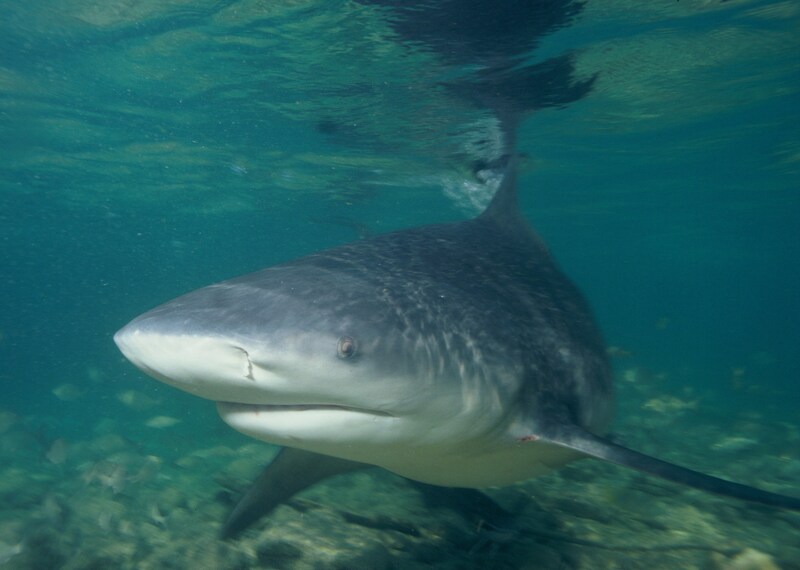 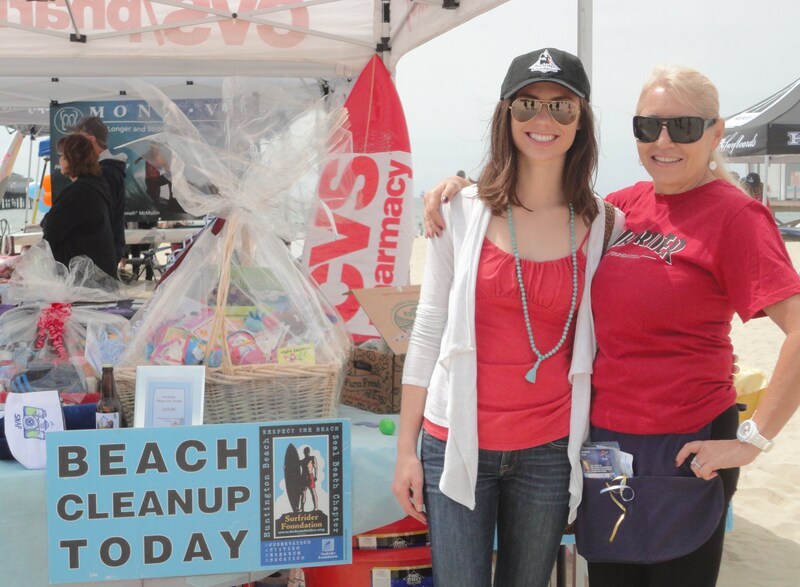 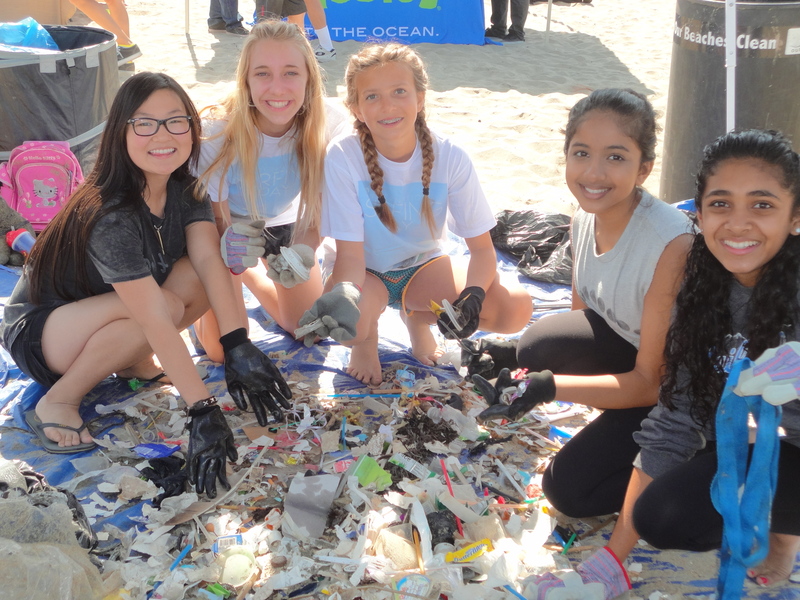 SurfWriter Girls Patti Kishel and Sunny Magdaug love this fun-filled beach day that brings everyone together to relax and learn about our earth – especially the ocean. 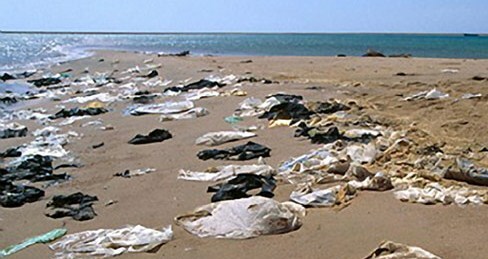 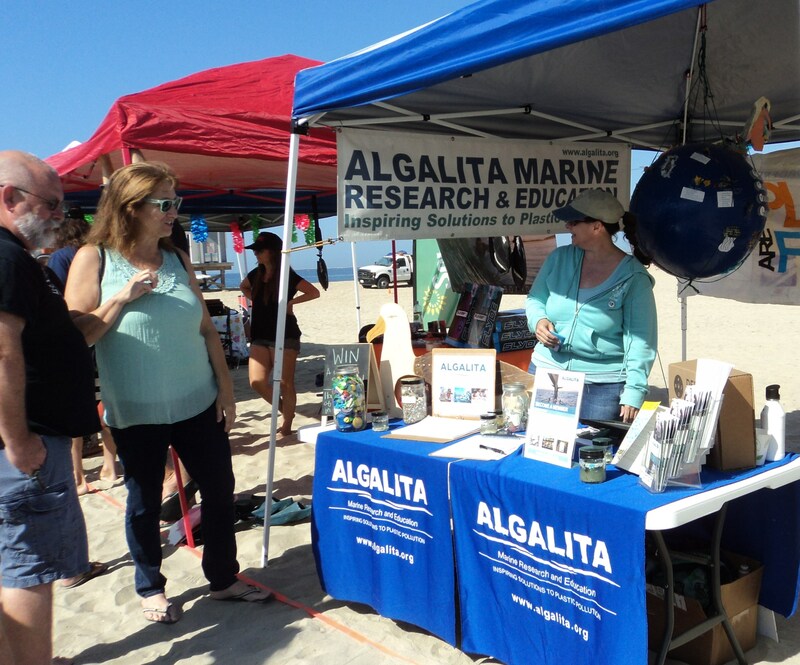 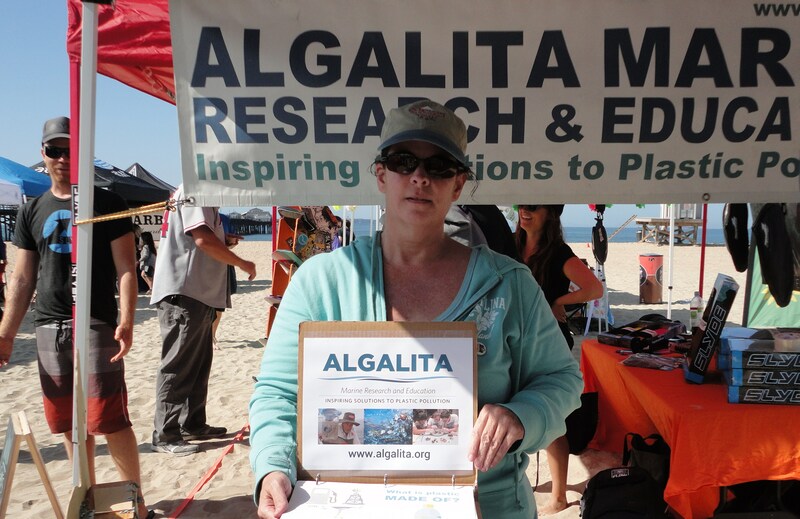 The Algalita marine research organization was on hand with executive director Liesl Thomas explaining the damaging effect that plastic pollution has on the sea ecosystem. 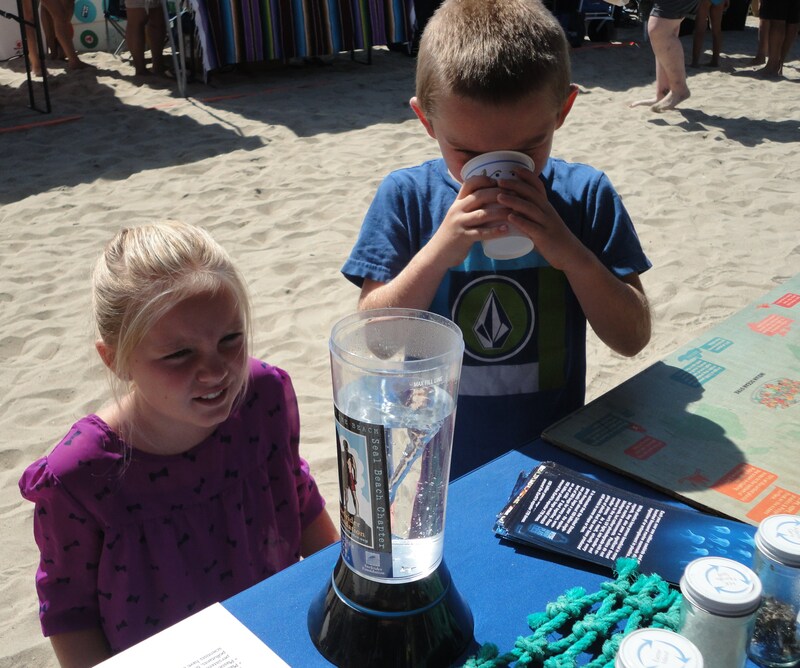 This year’s Ohana Day celebration included environmental education programs and lots of hands-on activities and demonstrations. 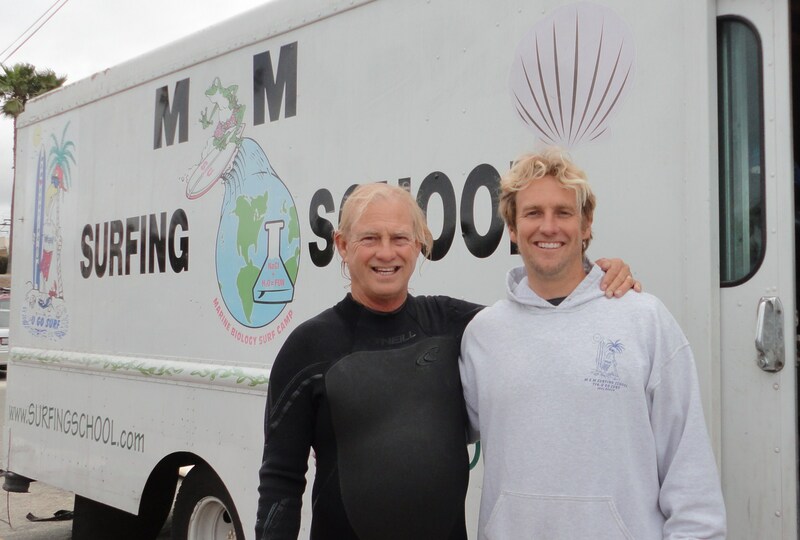 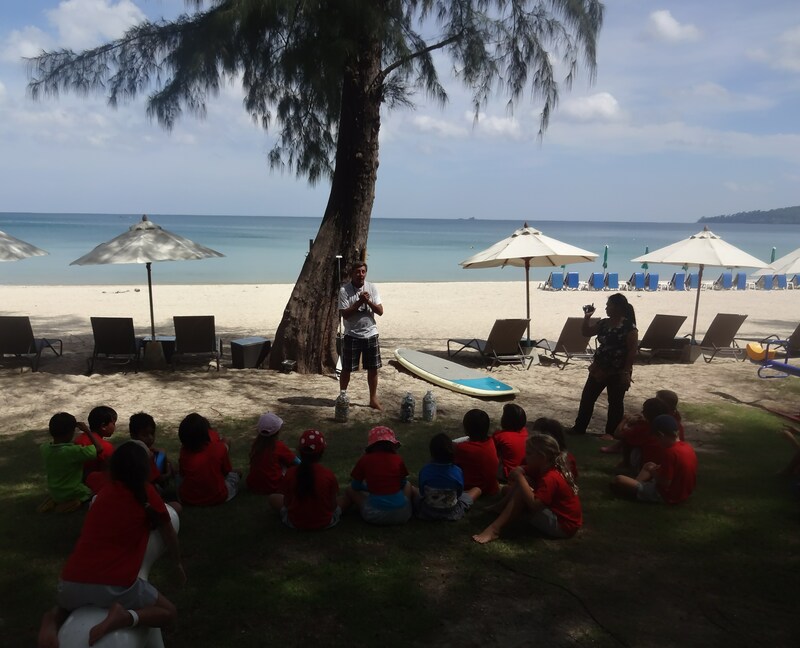 There were surfing lessons from M&M Surfing School. 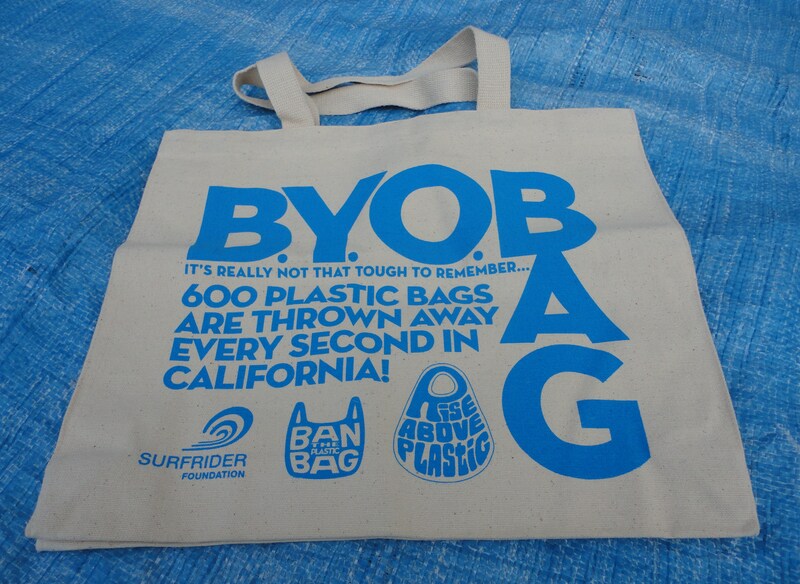 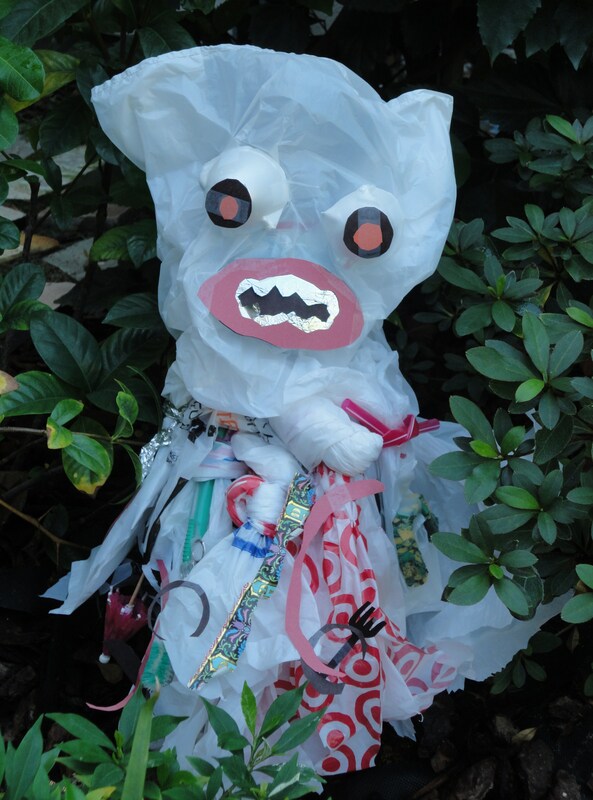 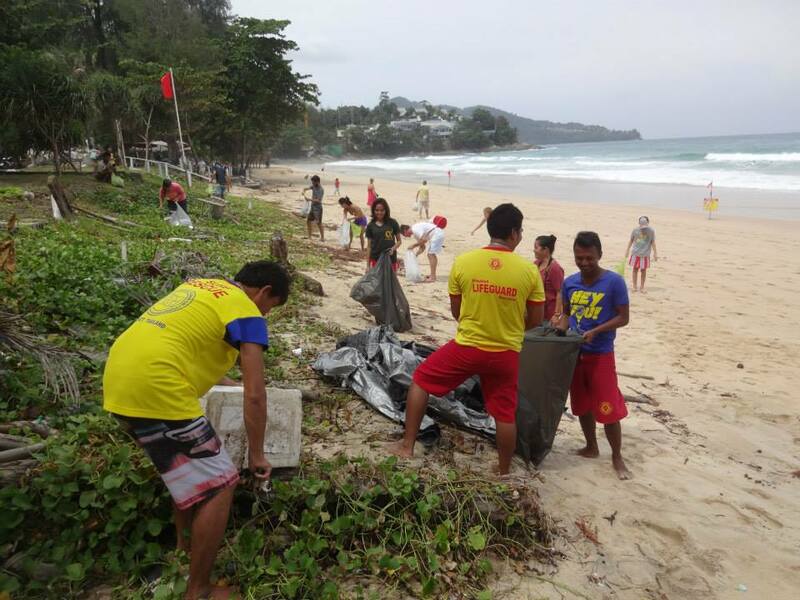 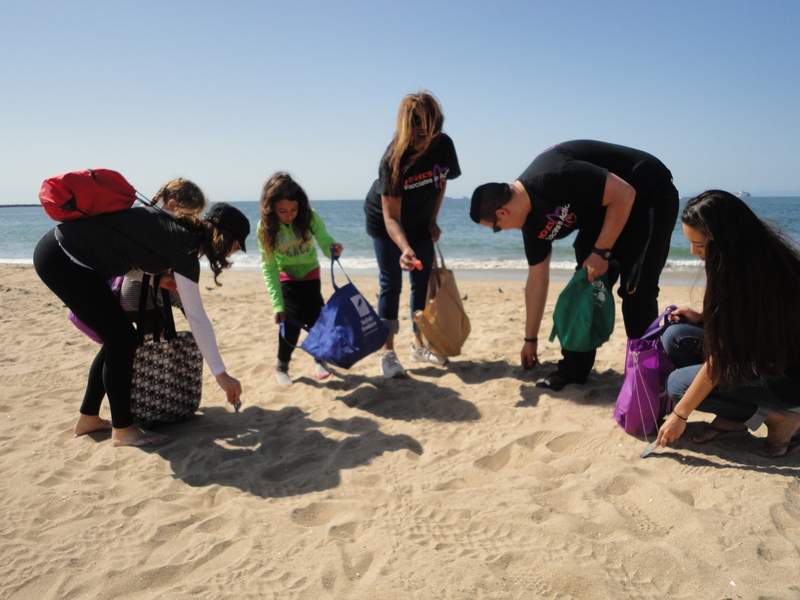 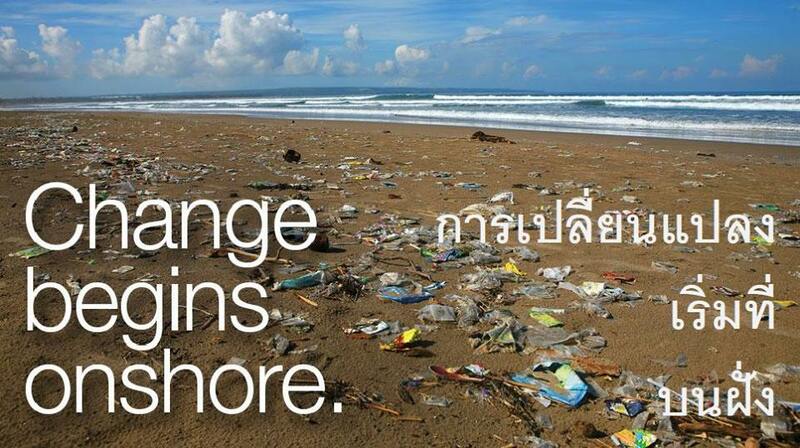 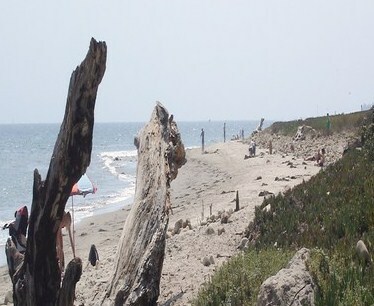 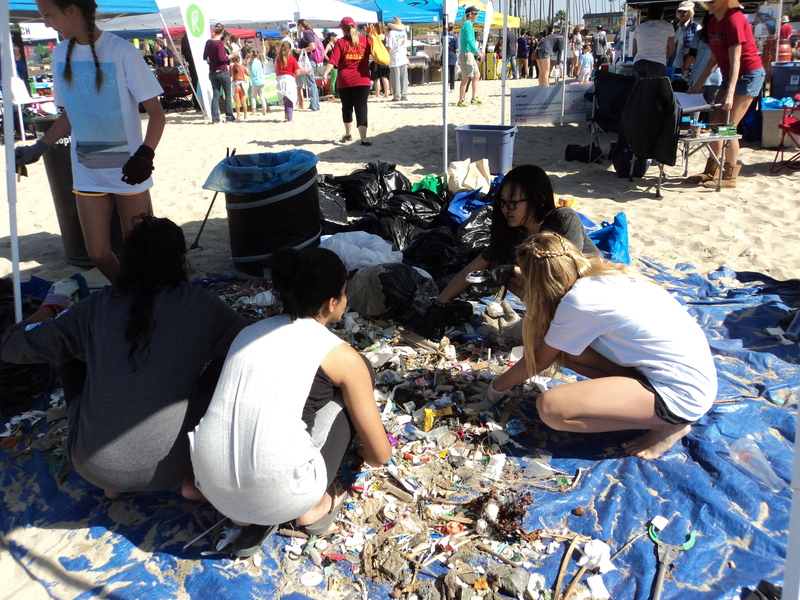 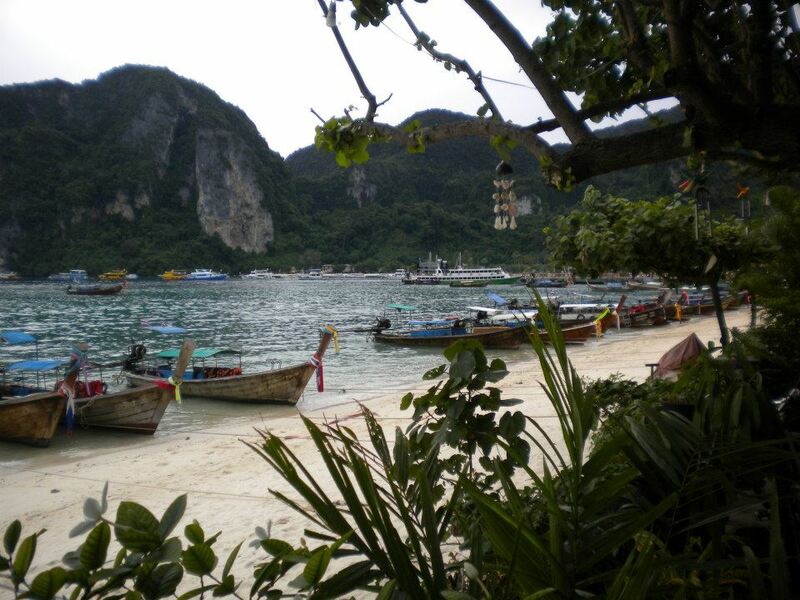 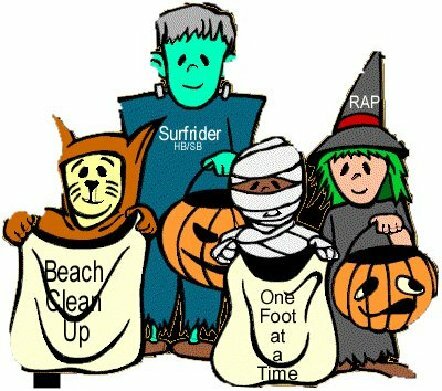 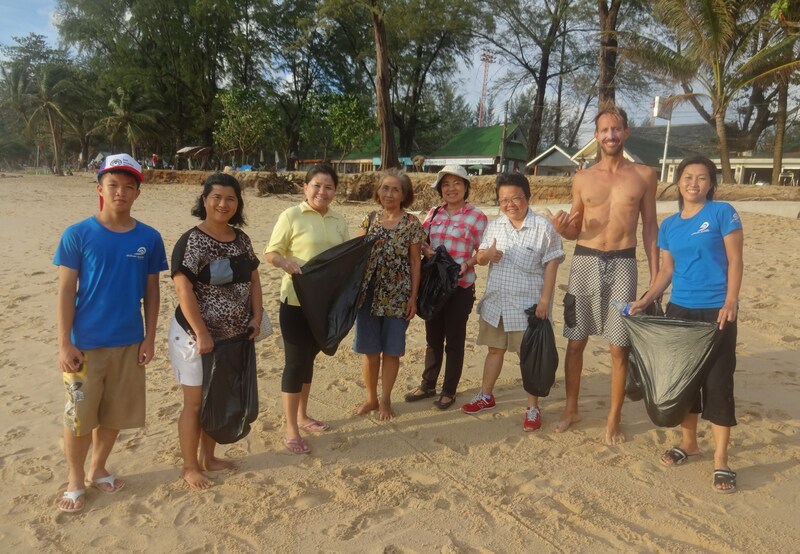 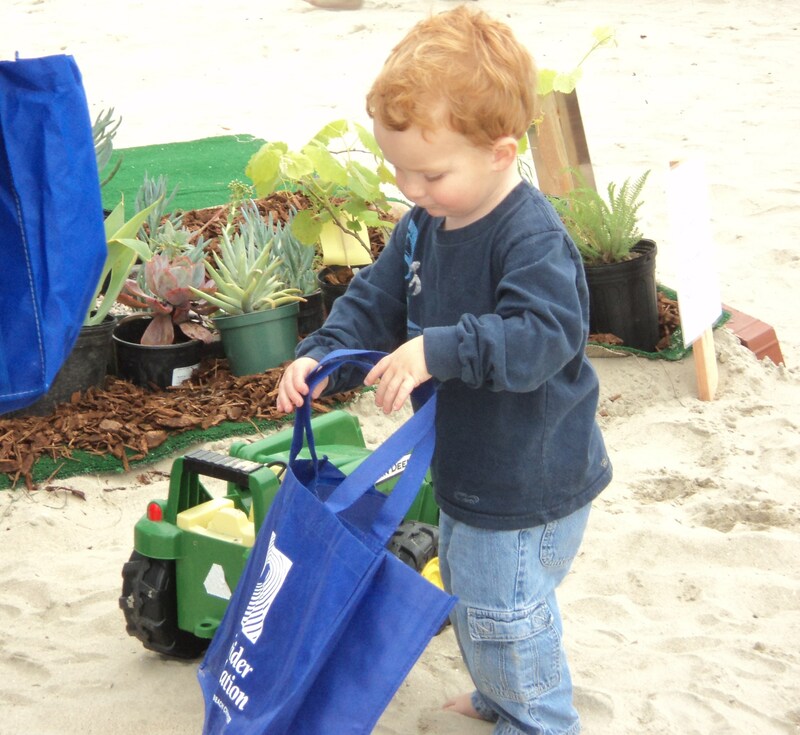 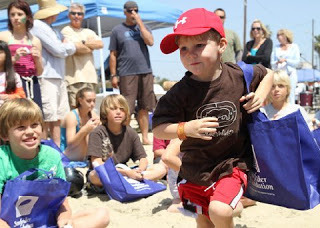 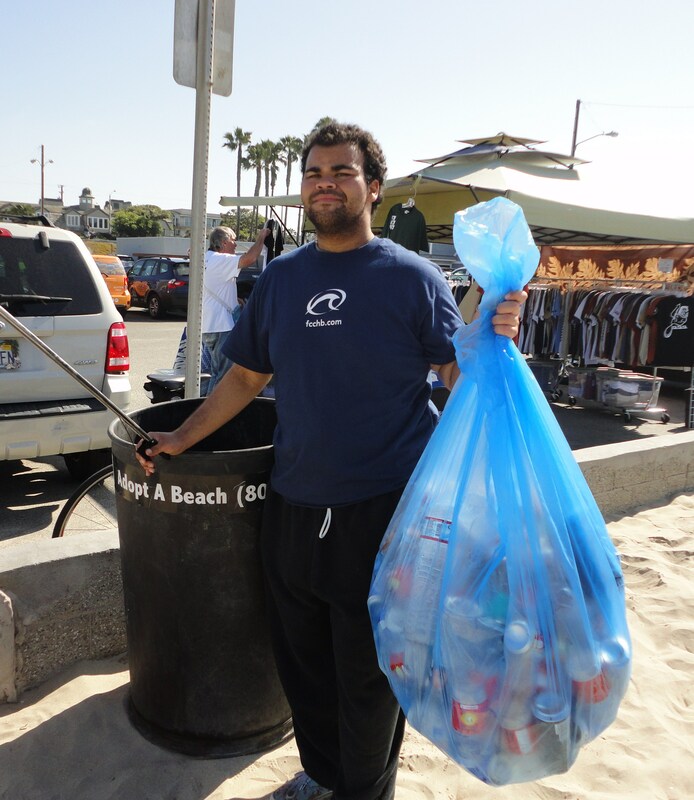 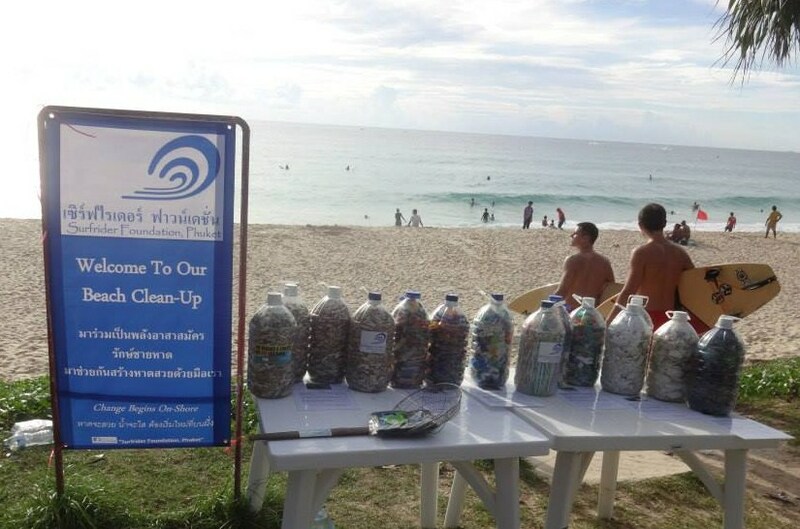 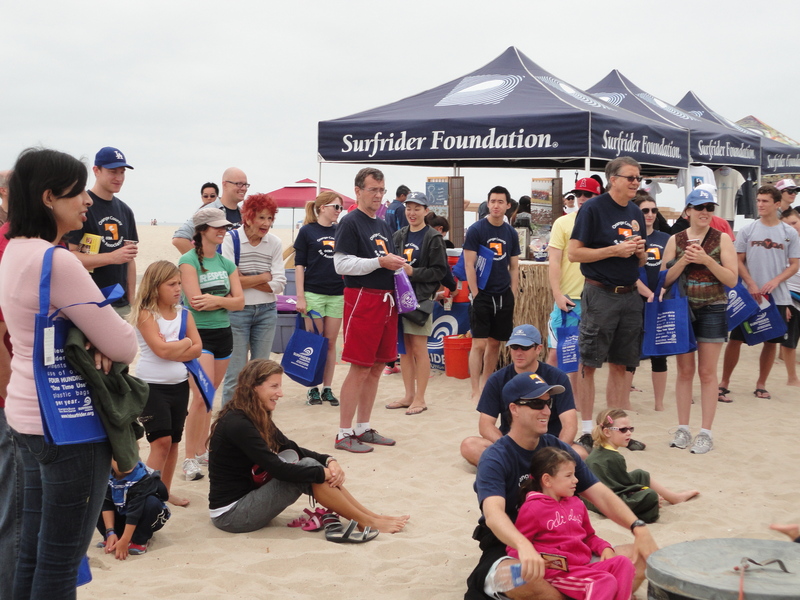 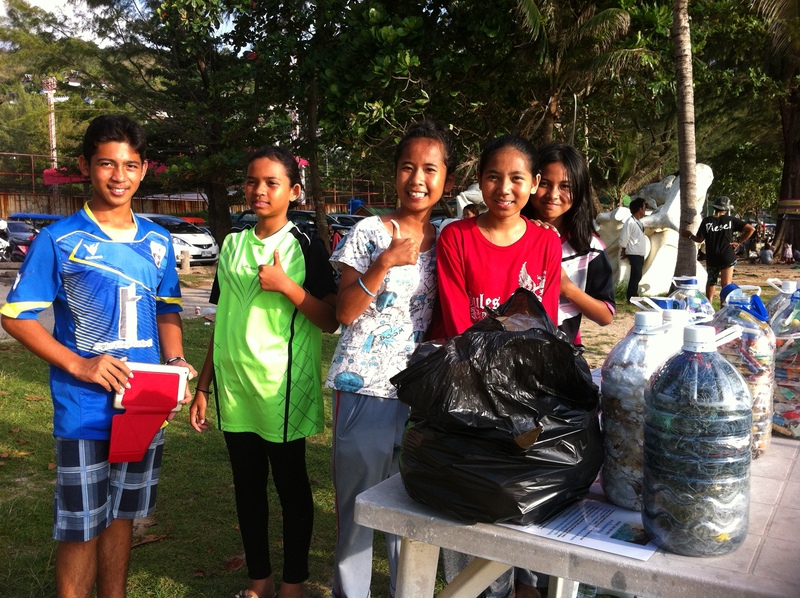 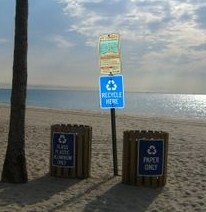 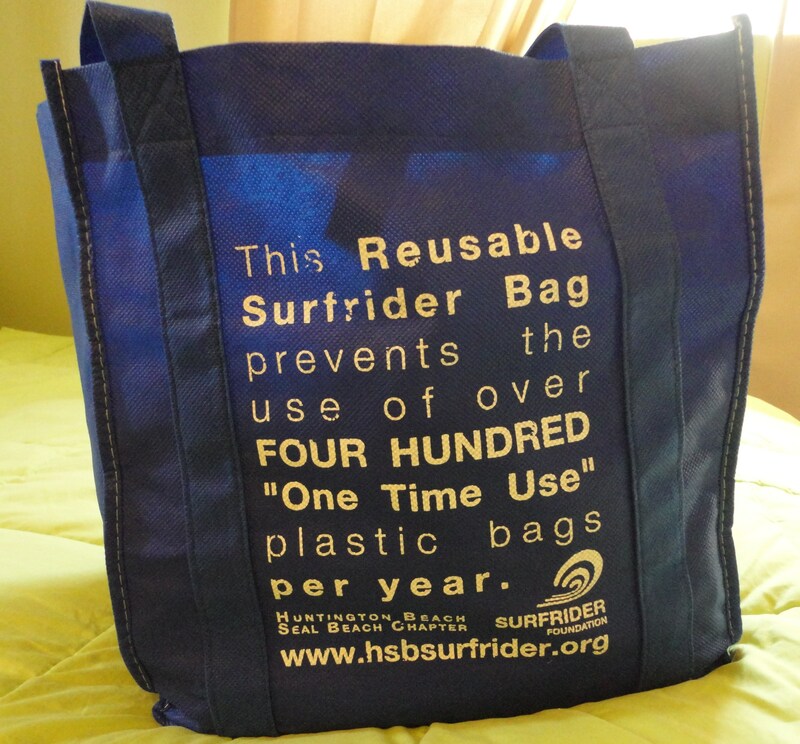 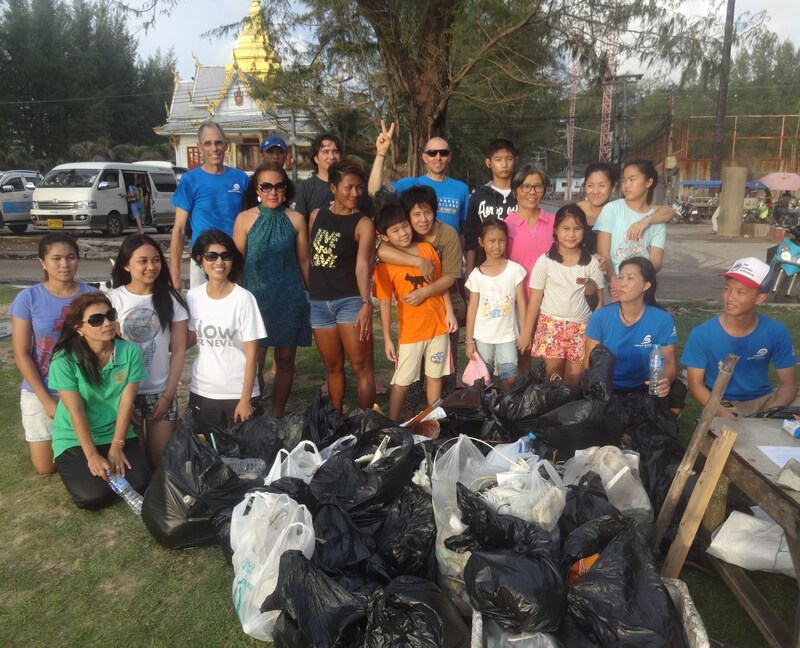 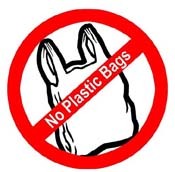 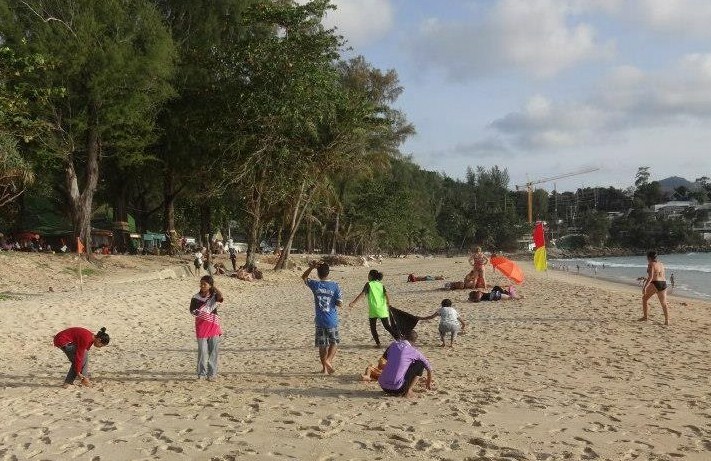 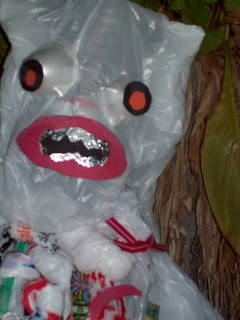 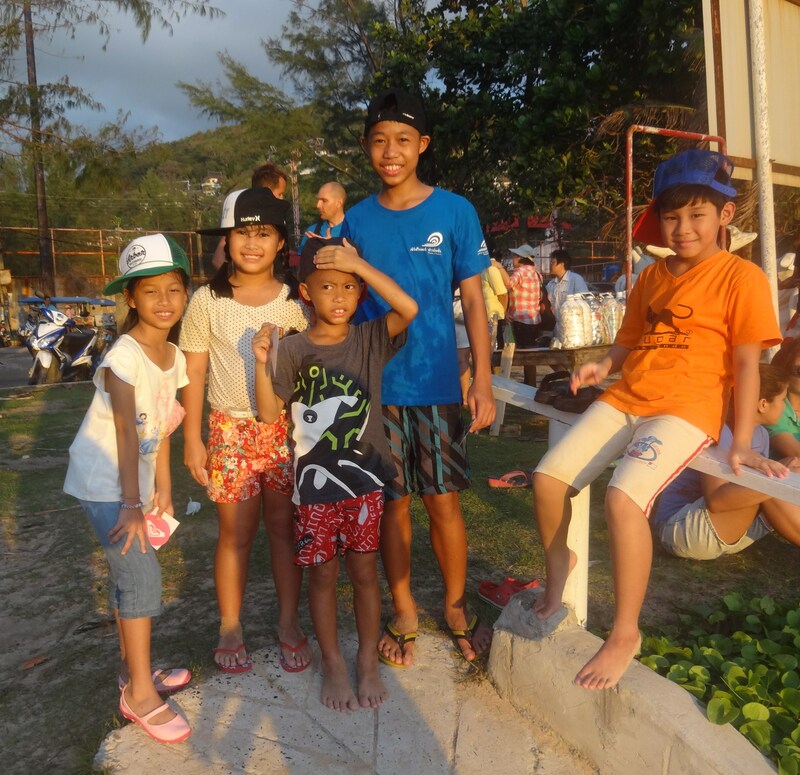 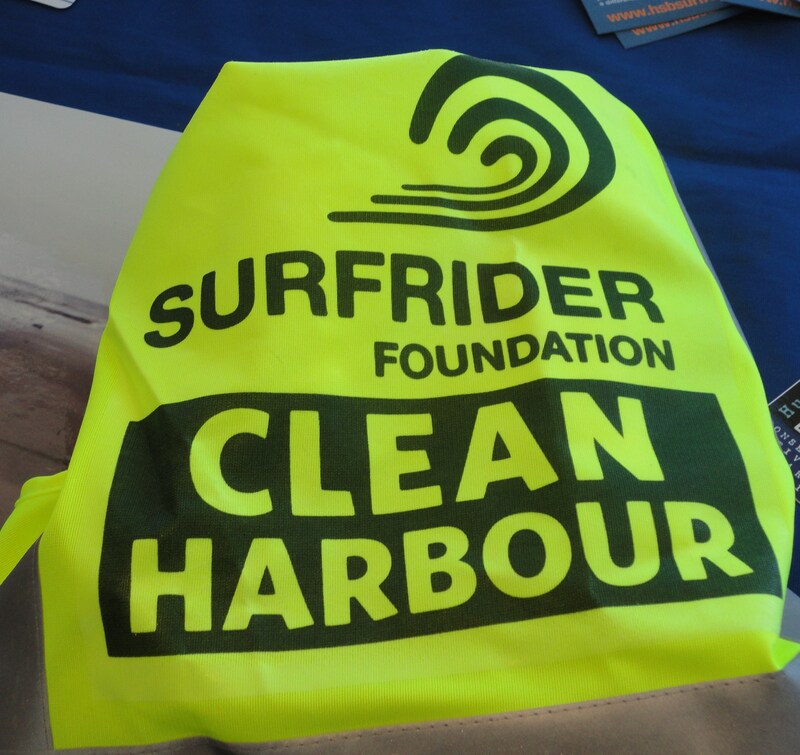 And beach cleanups led by Surfrider volunteers… with bags and bags of trash sorted for recycling. 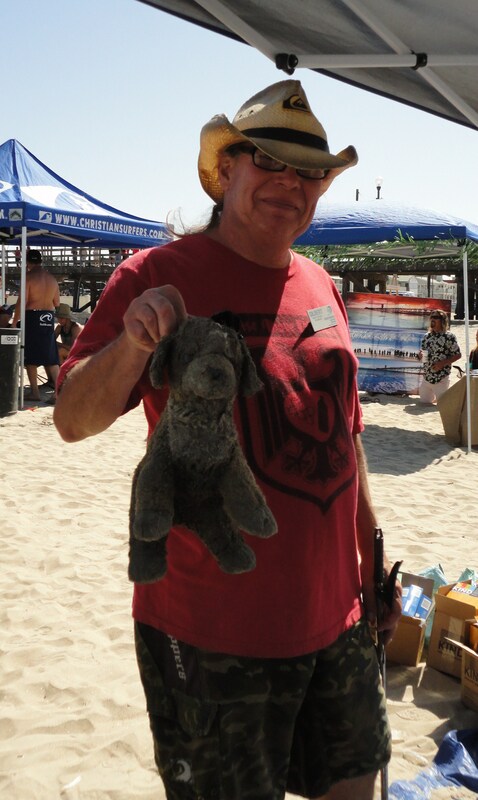 Even this poor little stuffed dog was found and rescued from the trash. 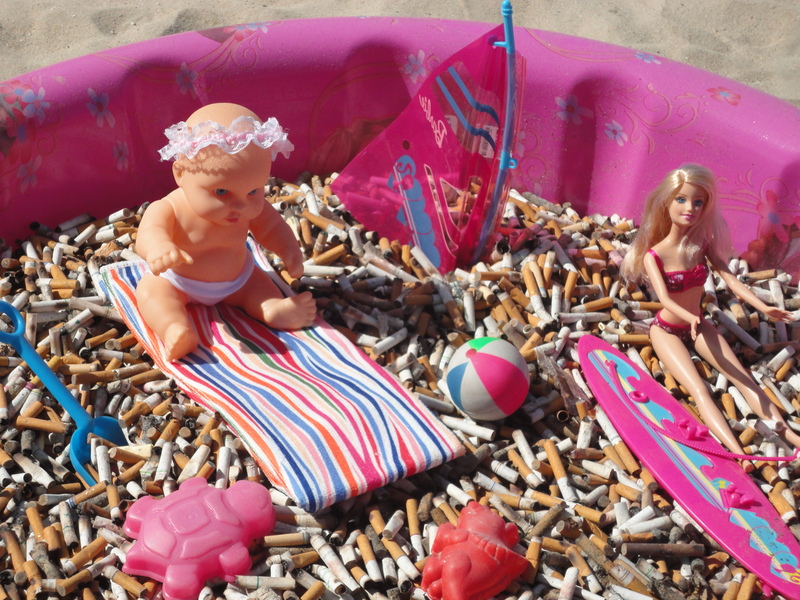 Butts Out campaign coordinators Norma and Alex Sellers used some of the discarded cigarette butts they gathered to make a satirical display showcasing how toxic the beach can be when it’s littered with cigarette butts. 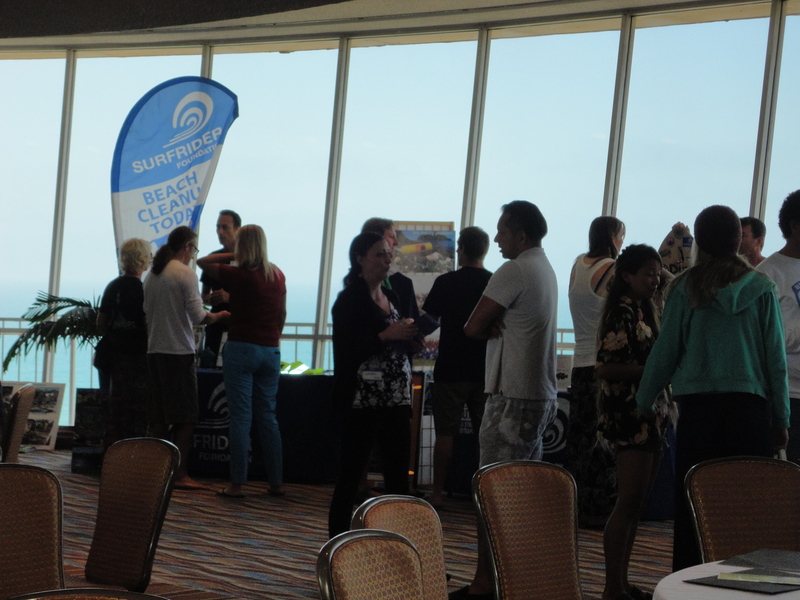 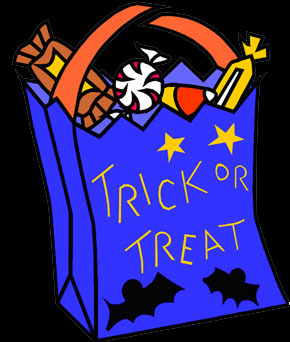 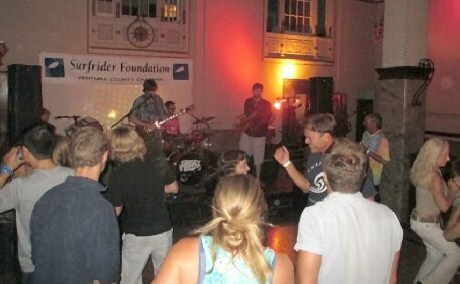 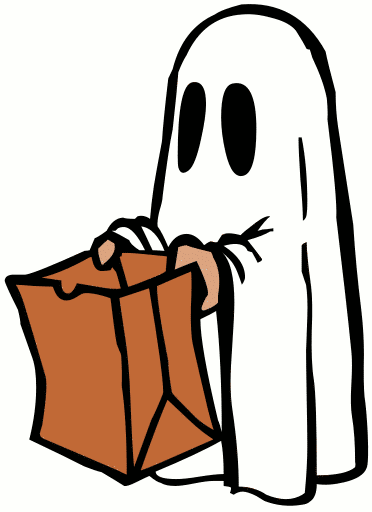 There were raffle prizes, giveaways and information provided by sponsors. 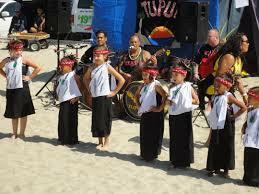 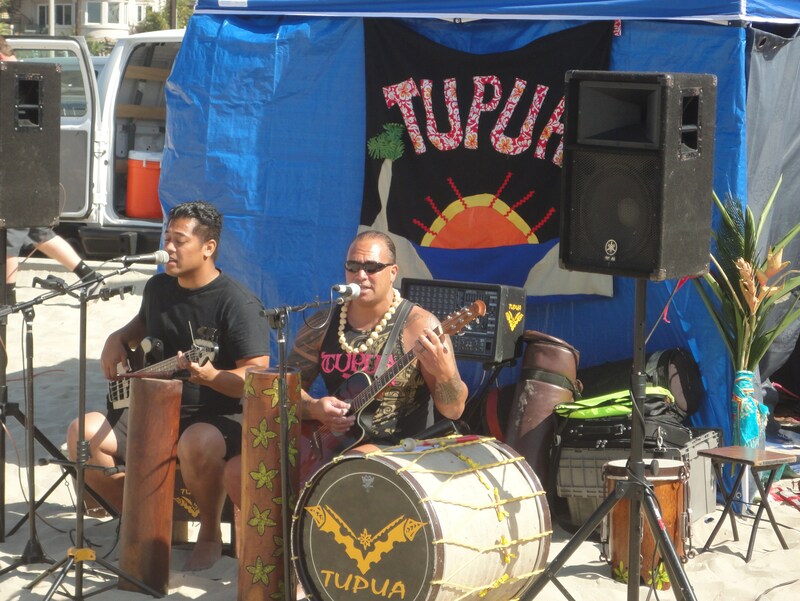 Music by Tupua with Polynesian dancers. 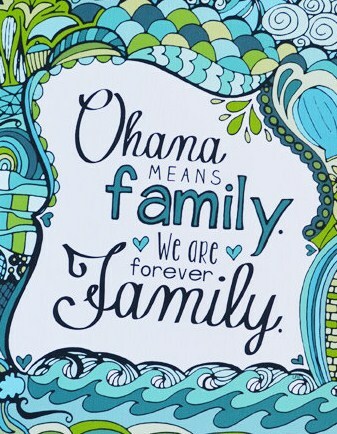 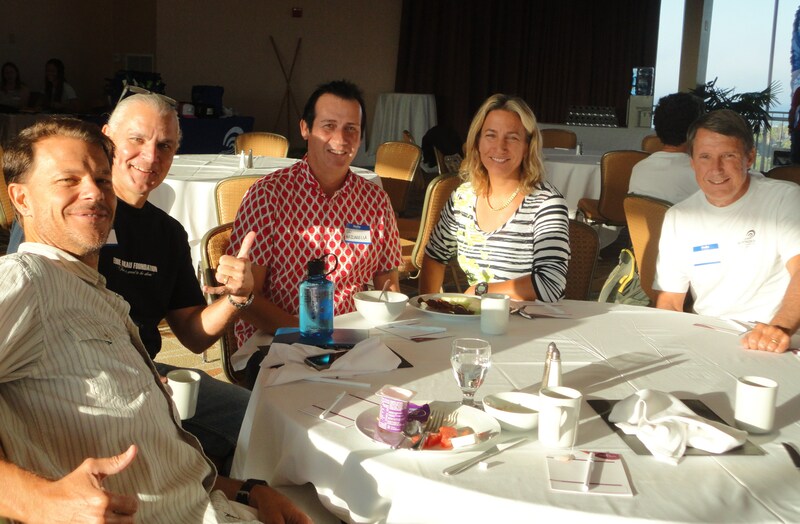 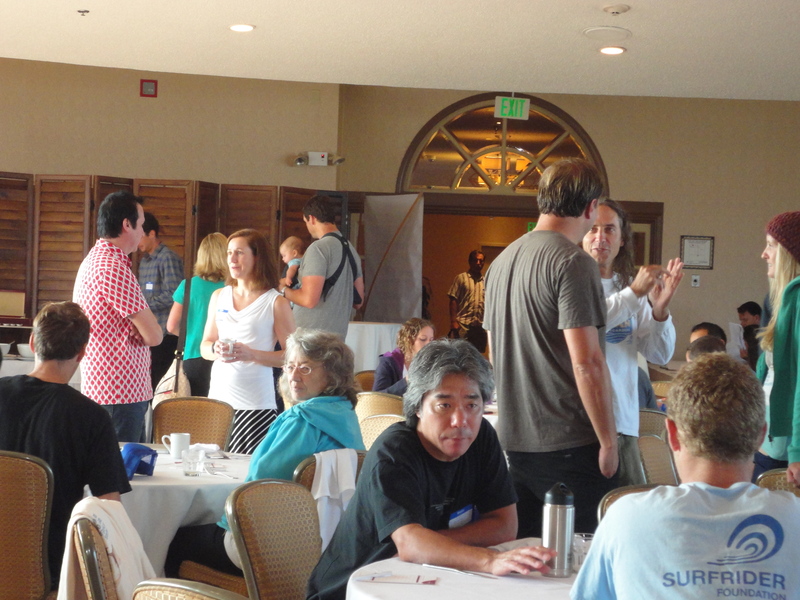 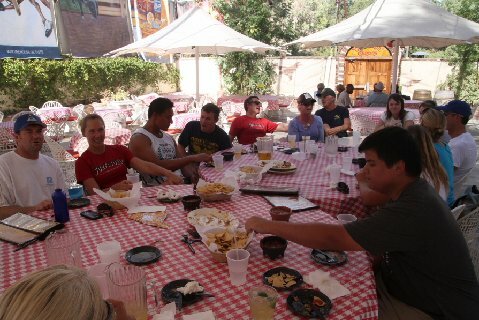 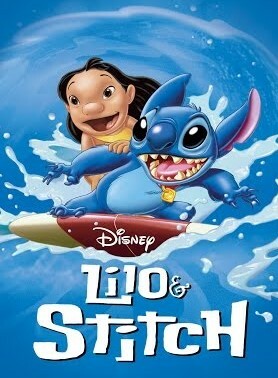 By the end of the day everyone felt a real sense of community, which is what Ohana Day is all about. 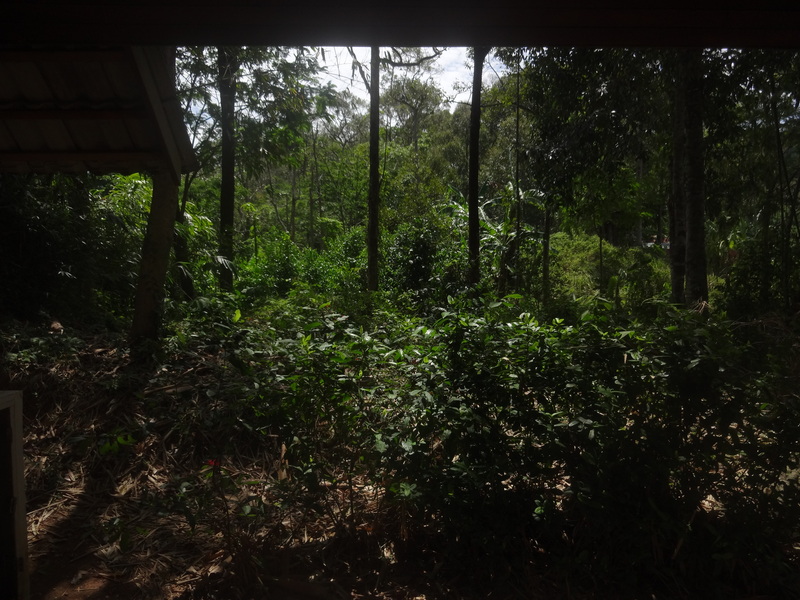 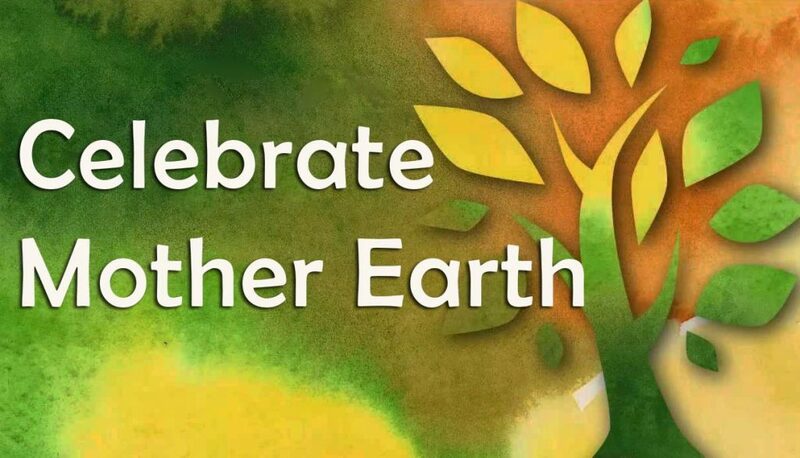 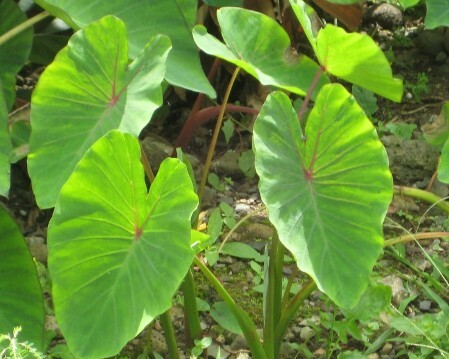 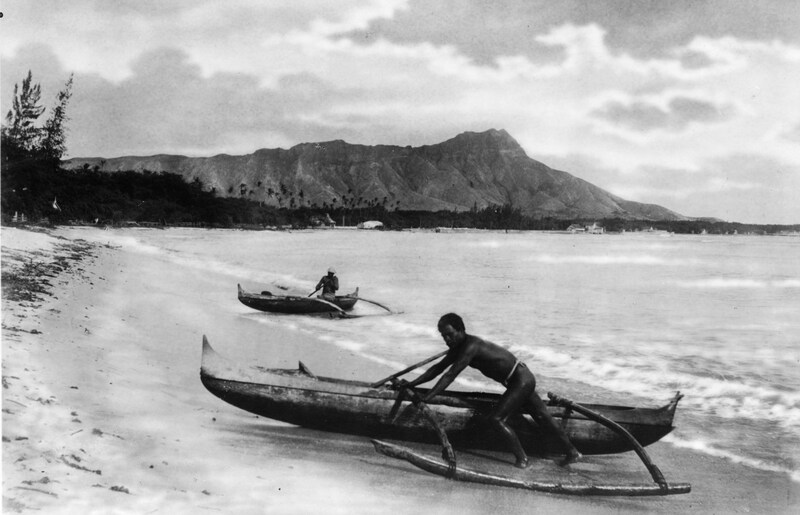 Just as the shoots of the taro plant come from a common bulb (oha), the Polynesians felt that we are all one family (ohana) and must work together and honor the land and sea that nurture us all. 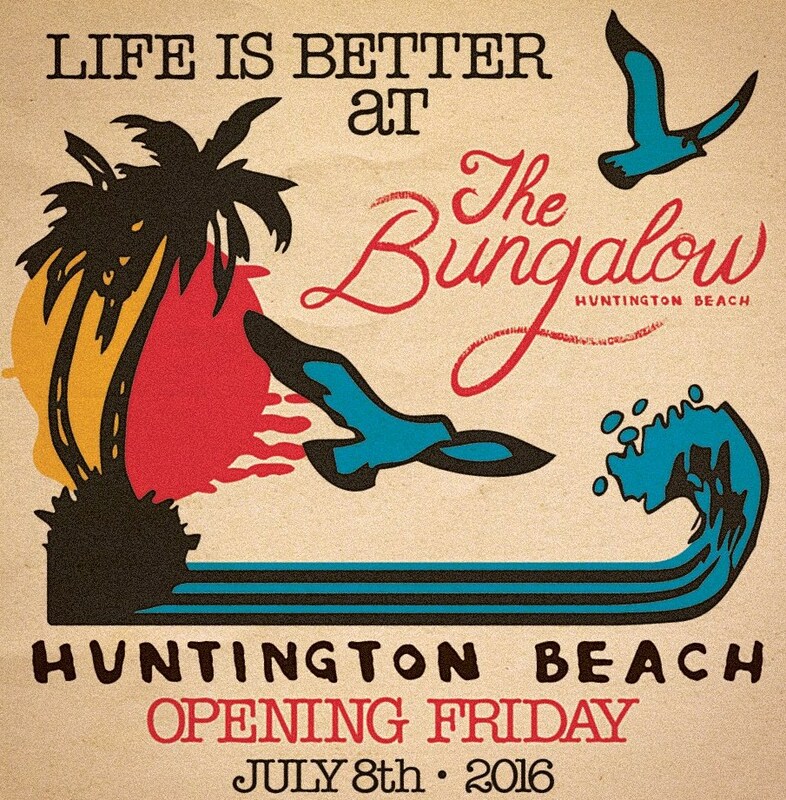 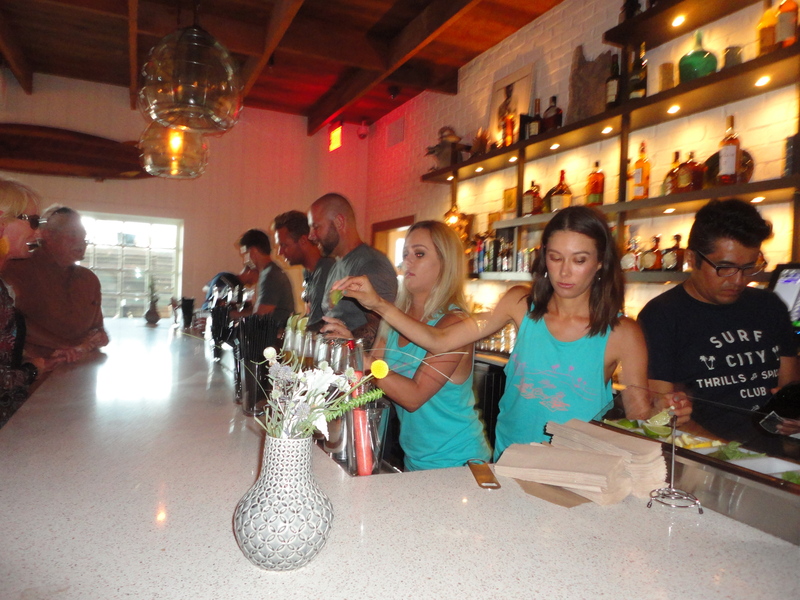 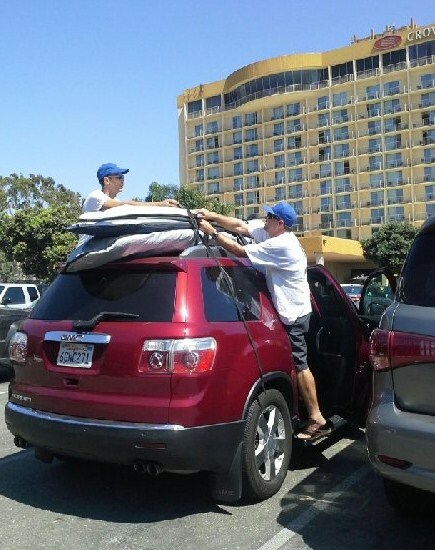 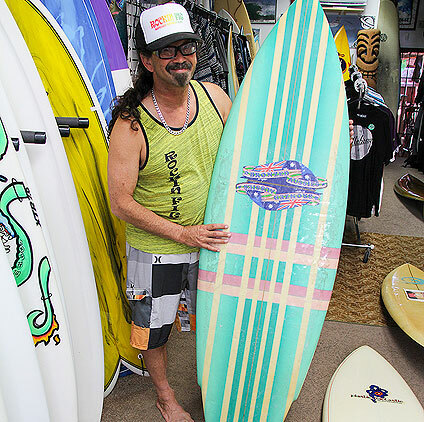 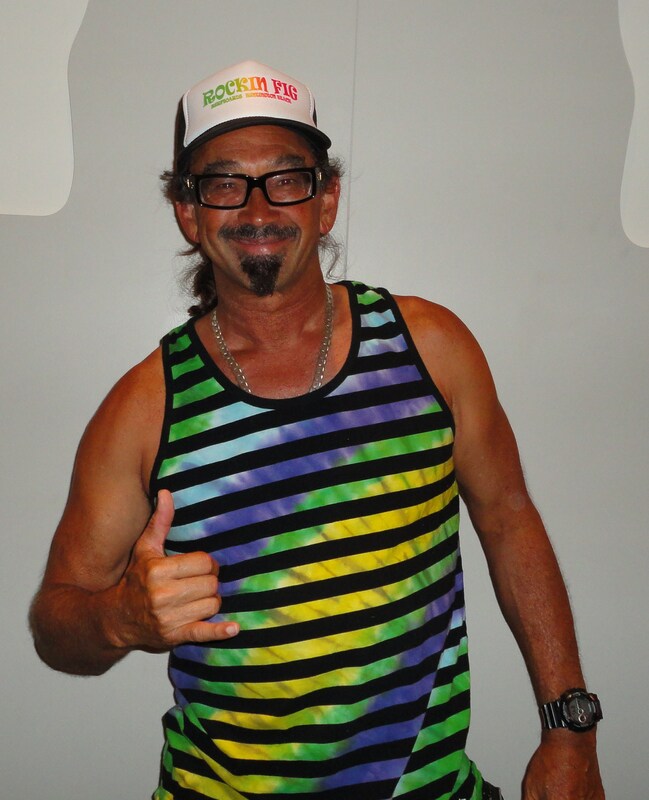 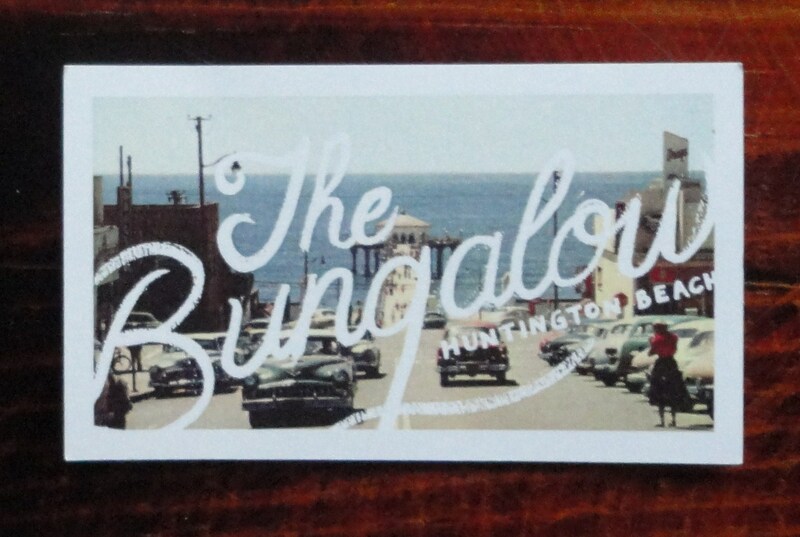 Huntington Beach local Rick Fignetti – known as Rockin Fig to his friends and fans – is a surfer’s surfer. 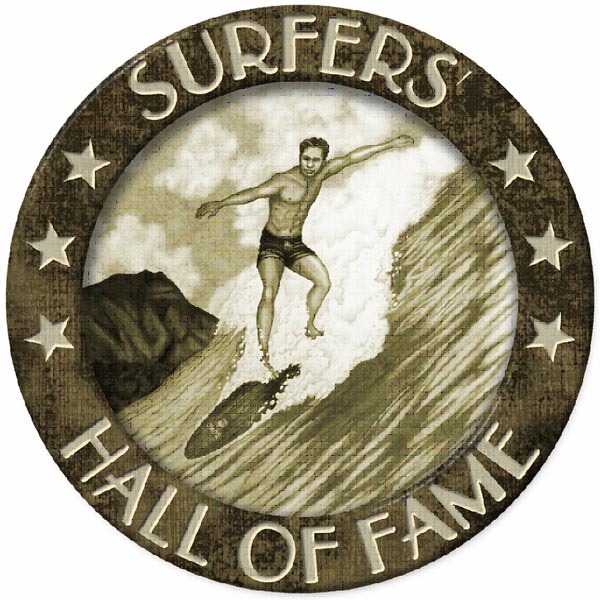 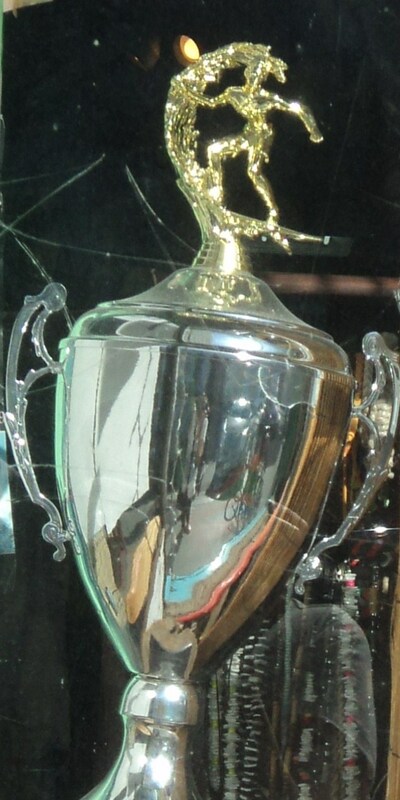 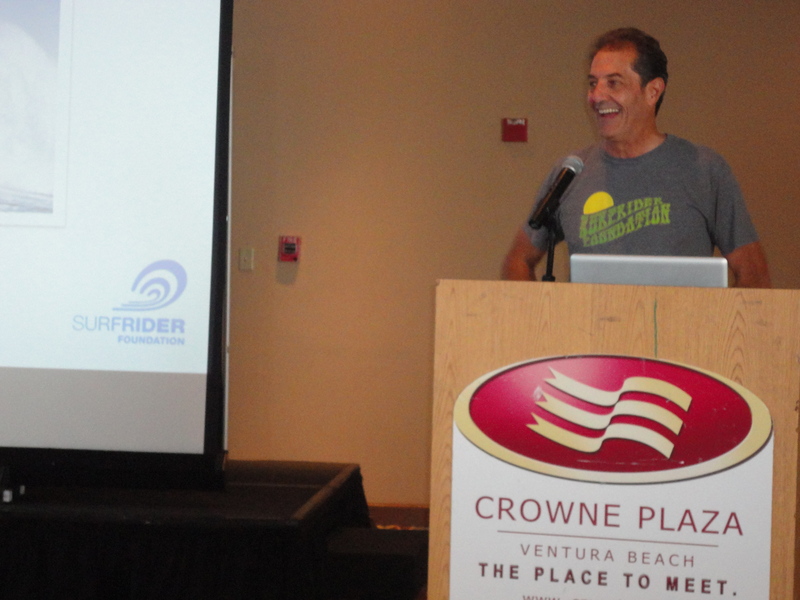 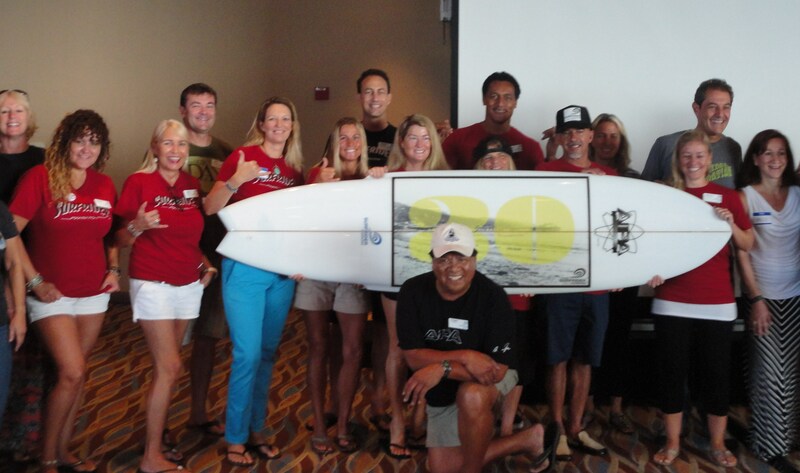 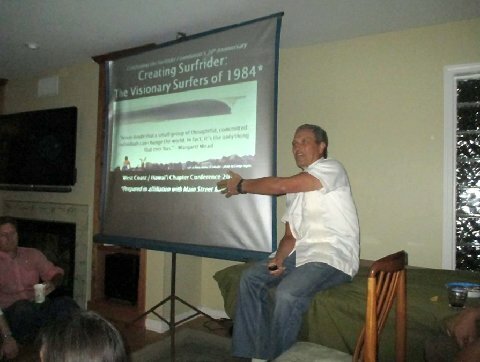 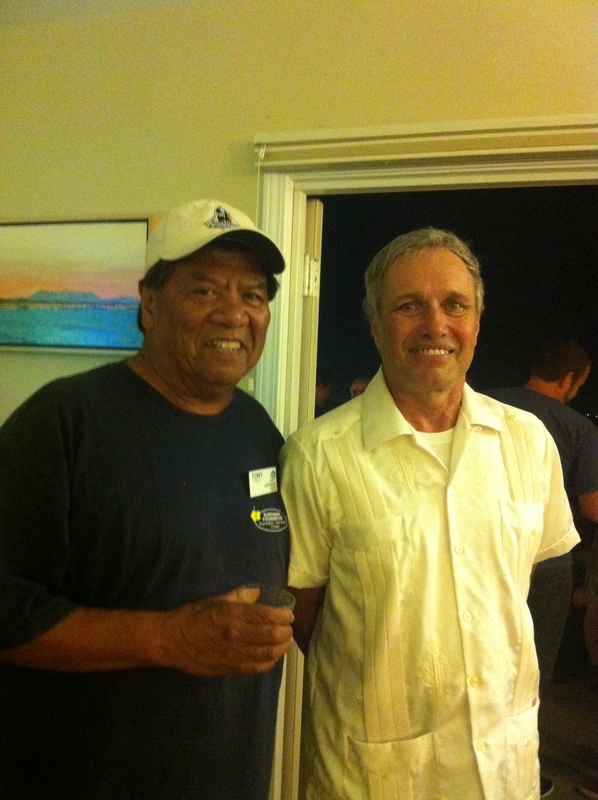 Fig is in both the Surfers’ Hall of Fame and the Surfing Walk of Fame. 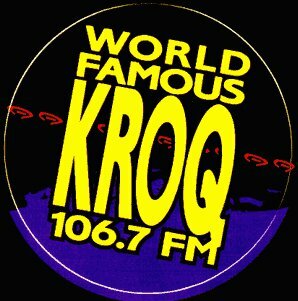 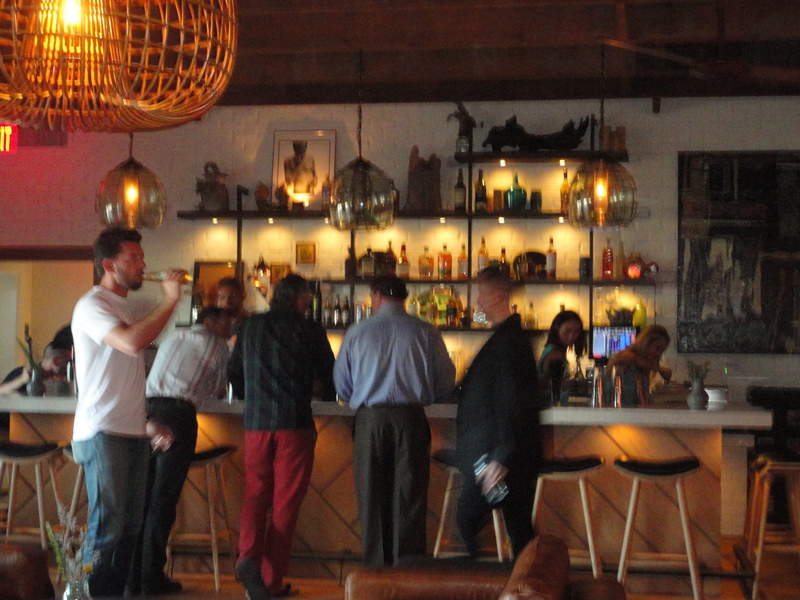 Anyone in earshot of Fig is likely to recognize his voice from his many years on the radio as KROQ’s Surfologist. 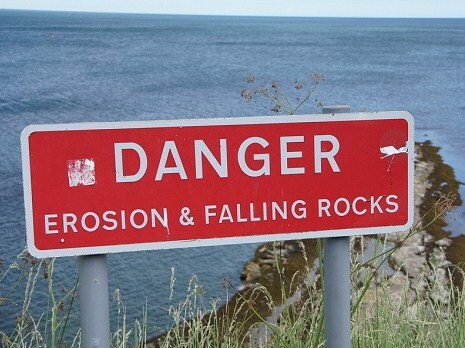 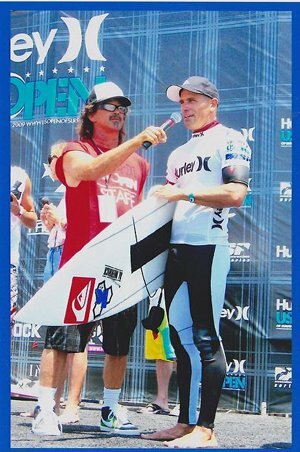 Or as the longtime announcer of the U.S. Open of Surfing (19 years in a row). 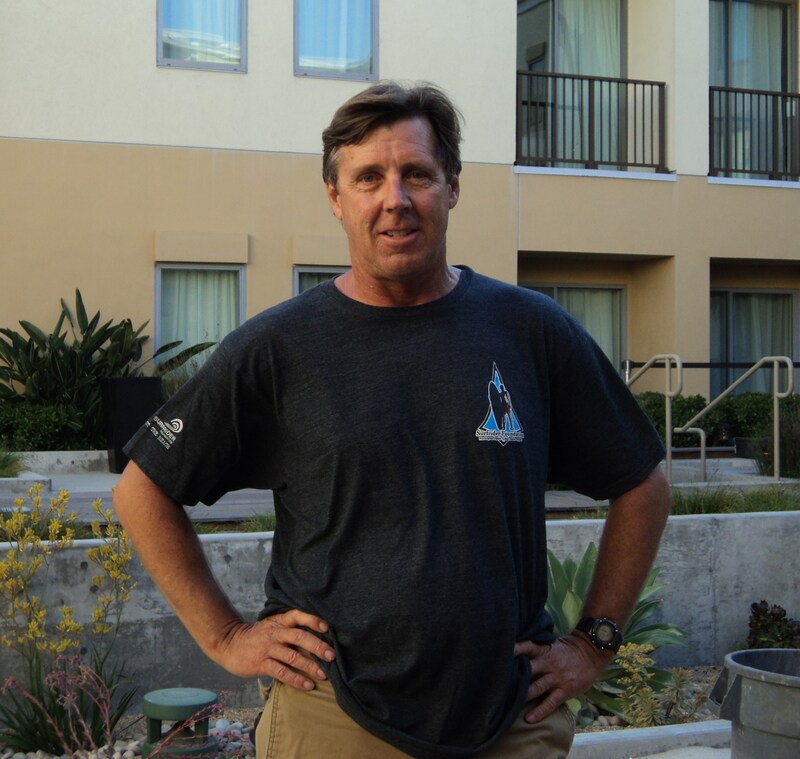 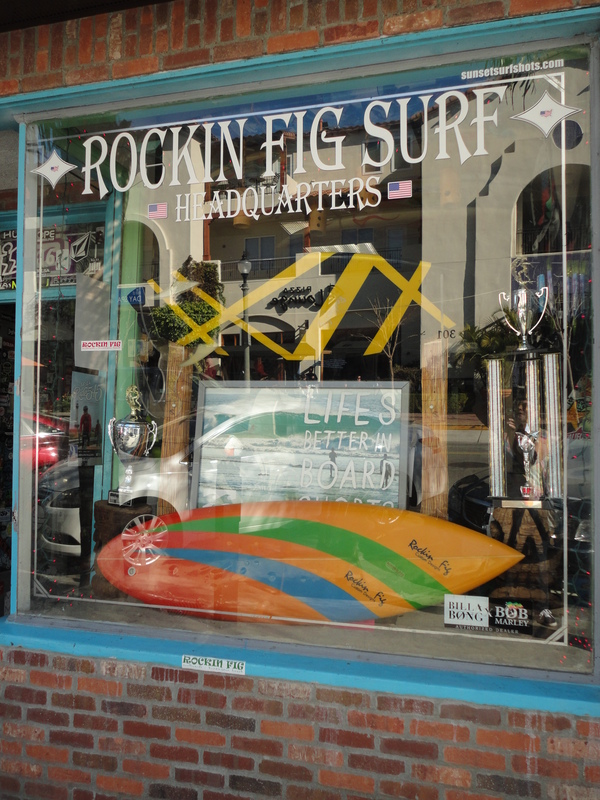 Fig’s life revolves around surfing whether it’s catching waves on the north side of the HB Pier, hanging out at Rockin Fig Surf Headquarters (316 Main Street), sponsoring the Fig Team Riders surfers, or mentoring the local groms. 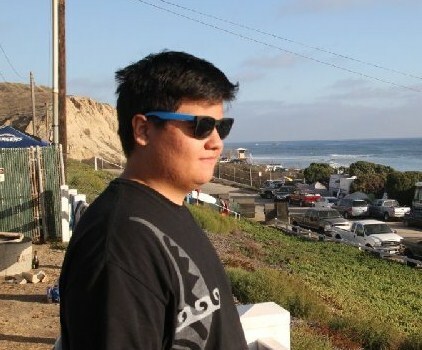 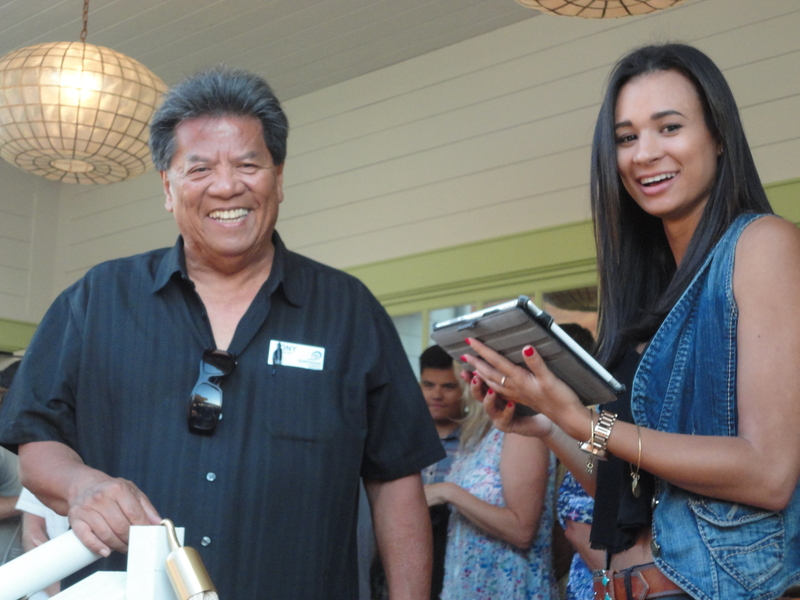 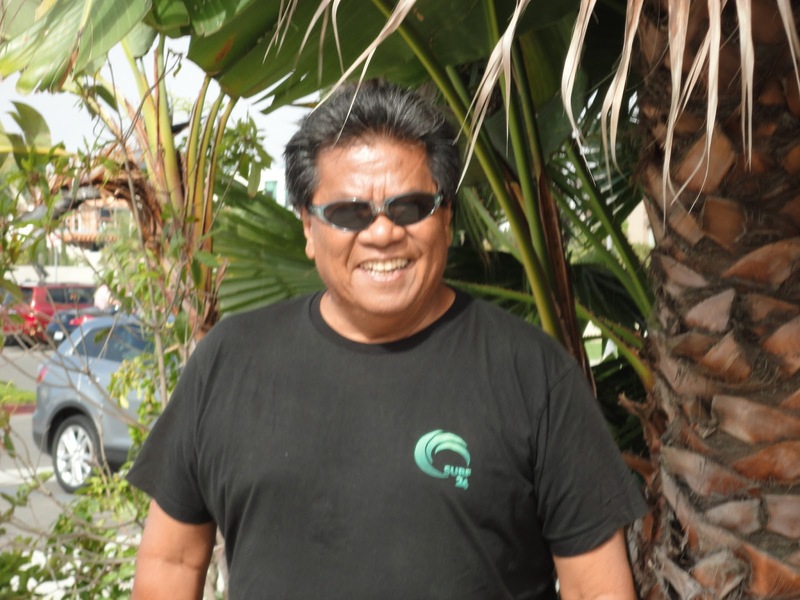 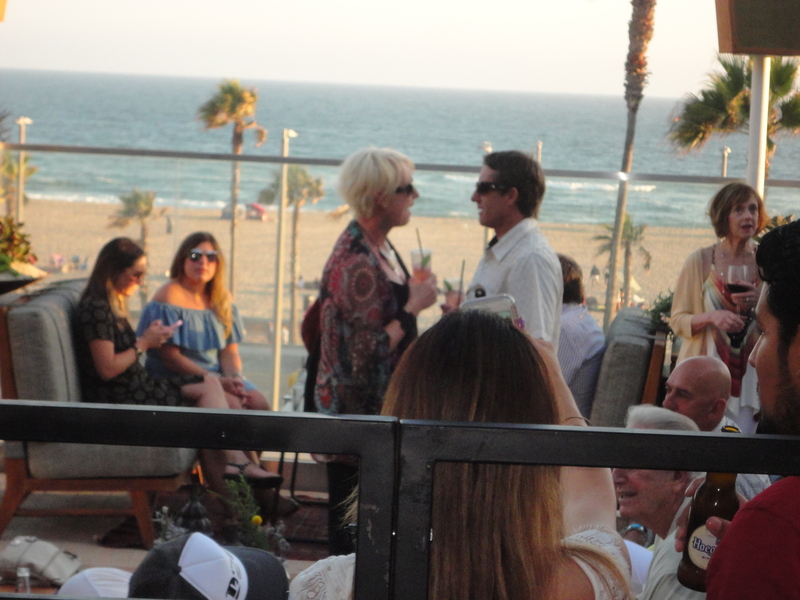 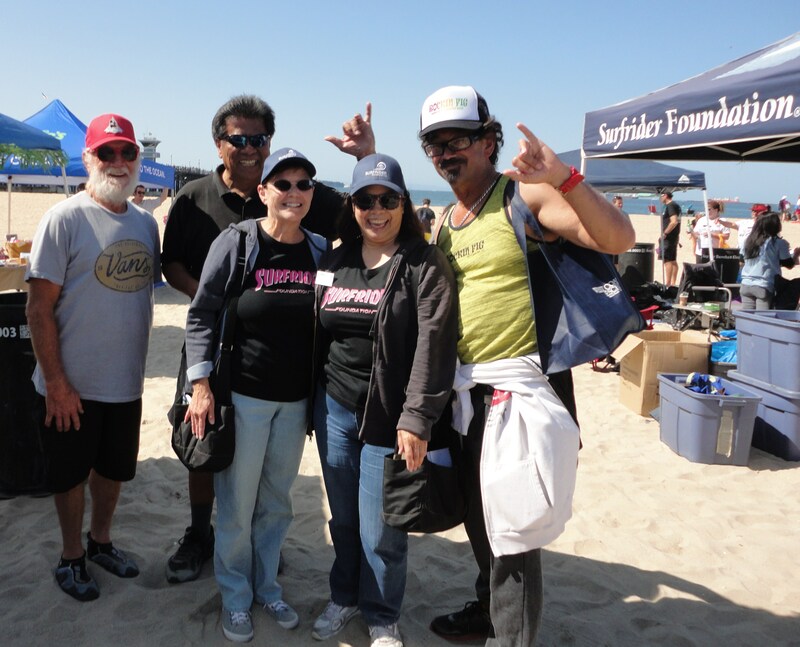 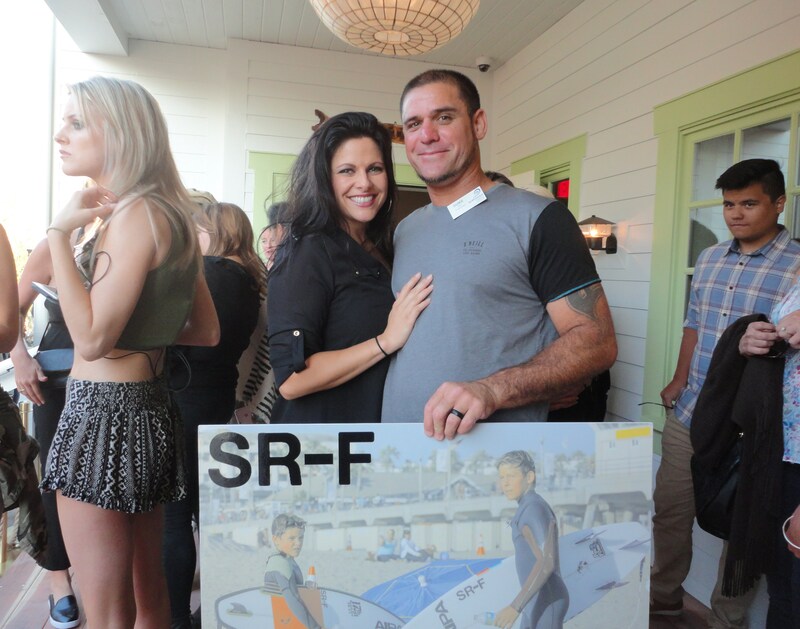 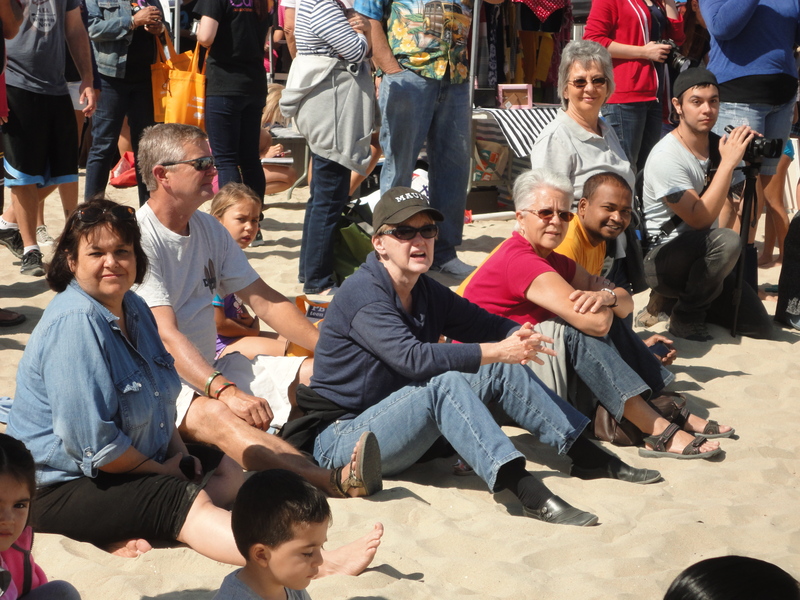 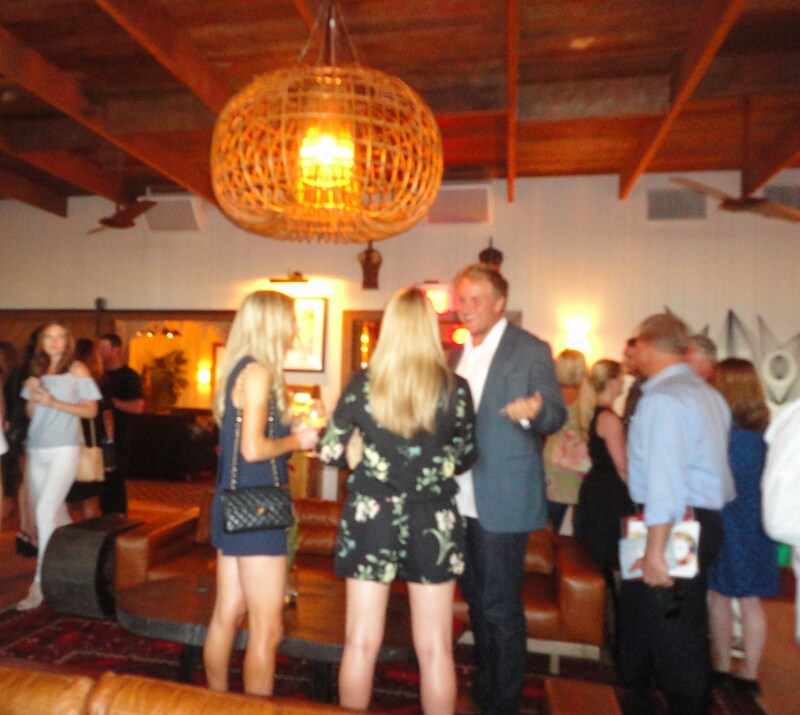 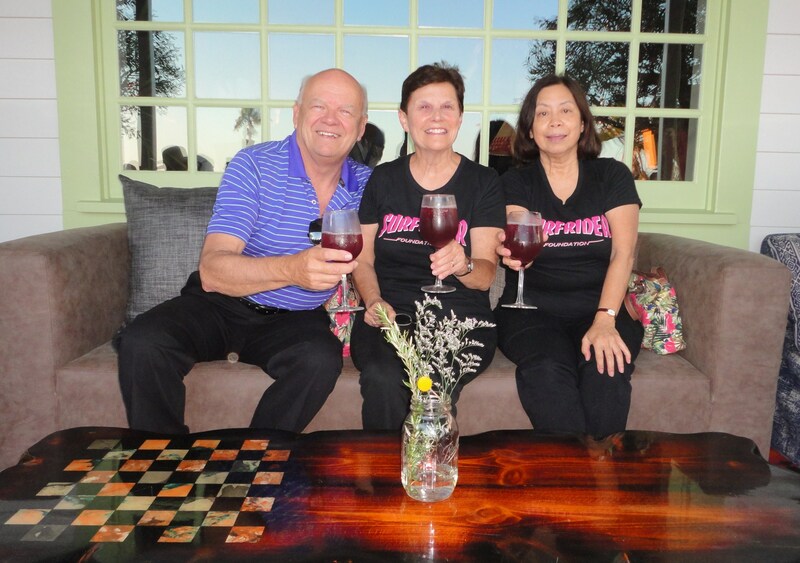 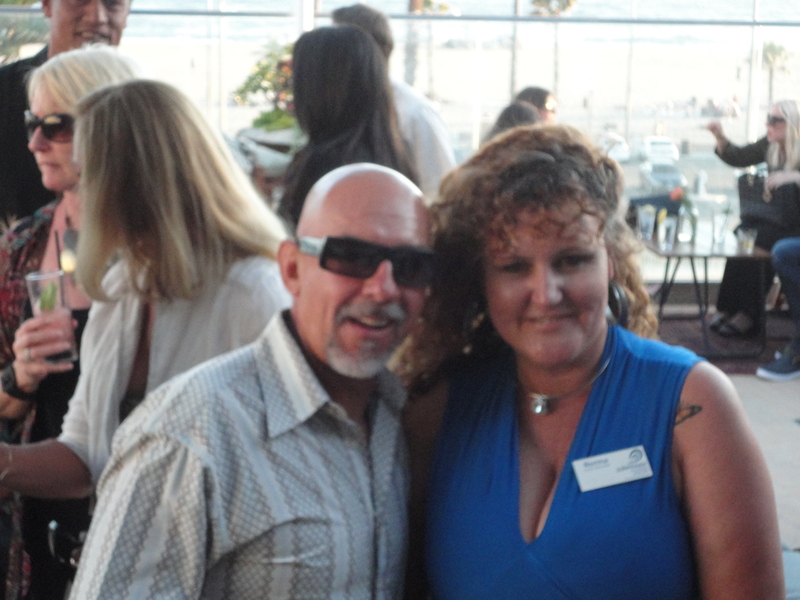 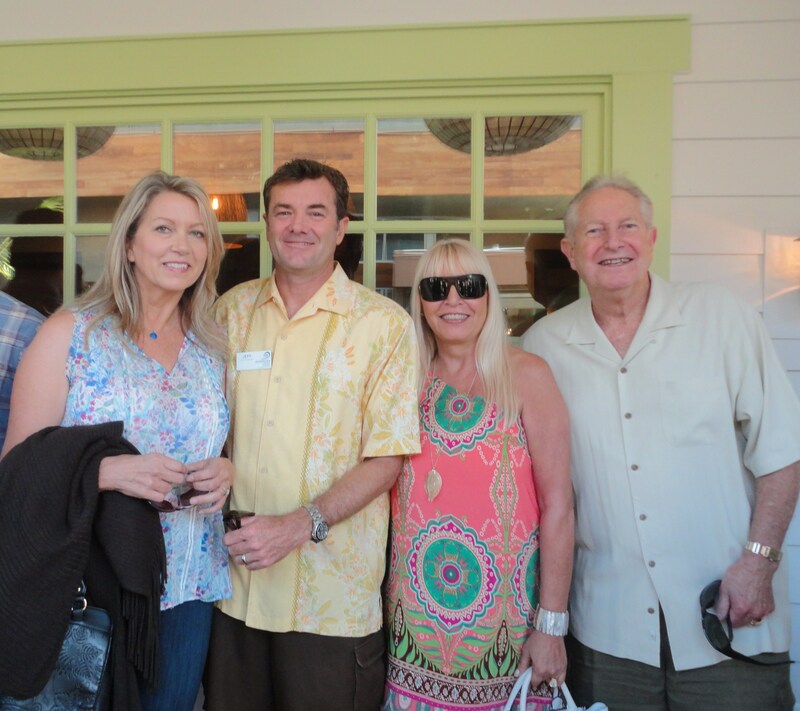 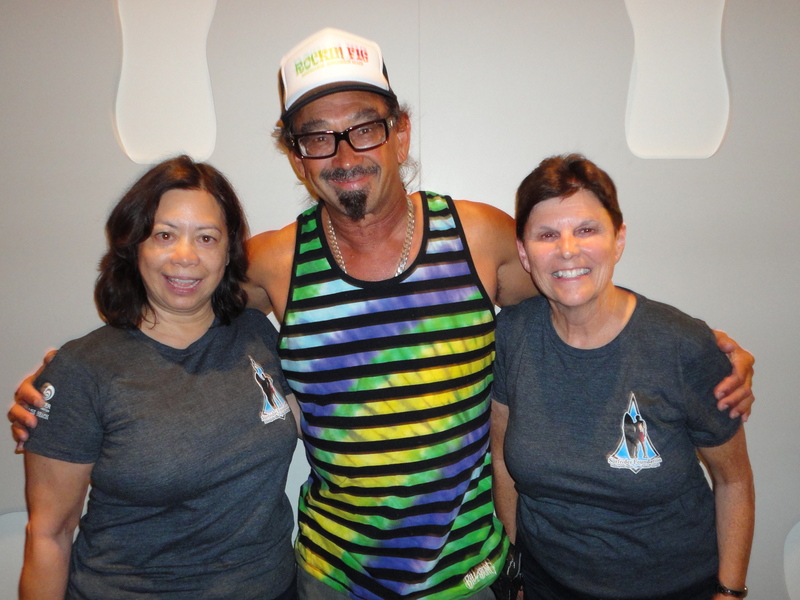 Whenever SurfWriter Girls Sunny Magdaug and Patti Kishel see Fig at beach events he’s always right in the middle of everything, lending a hand and helping to represent the community. 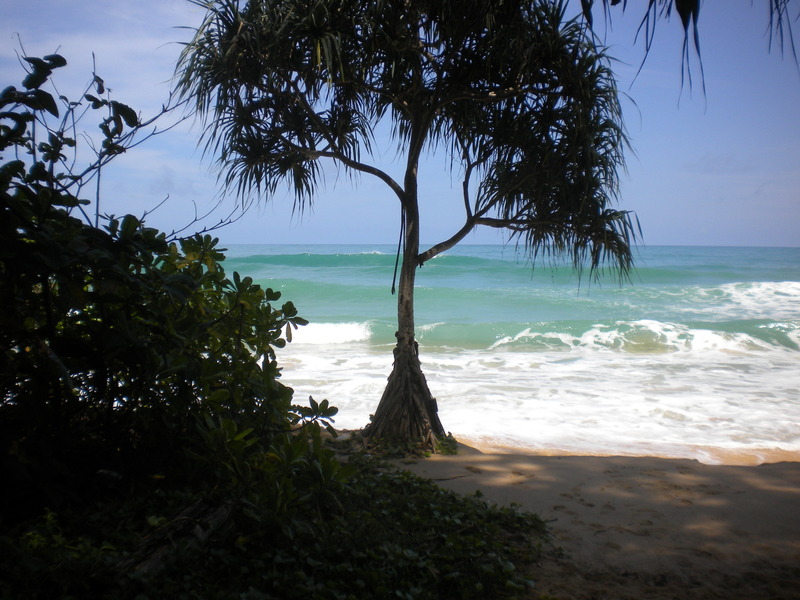 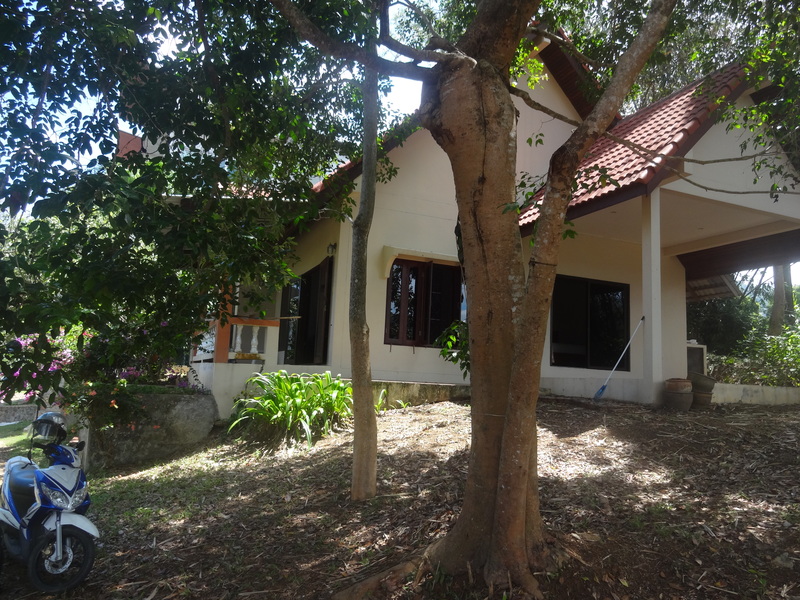 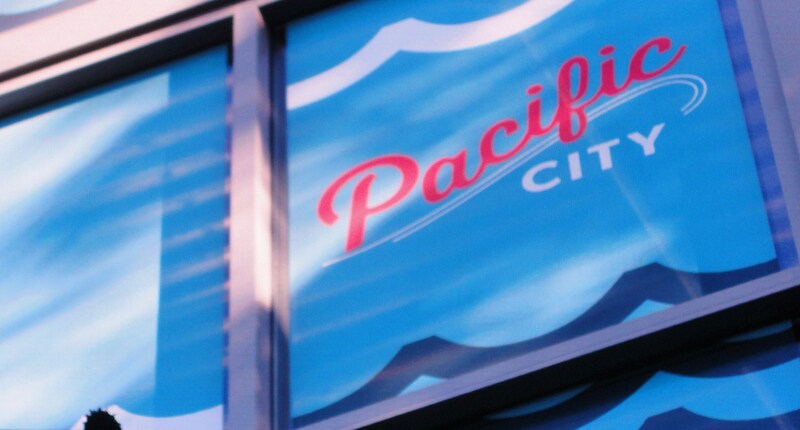 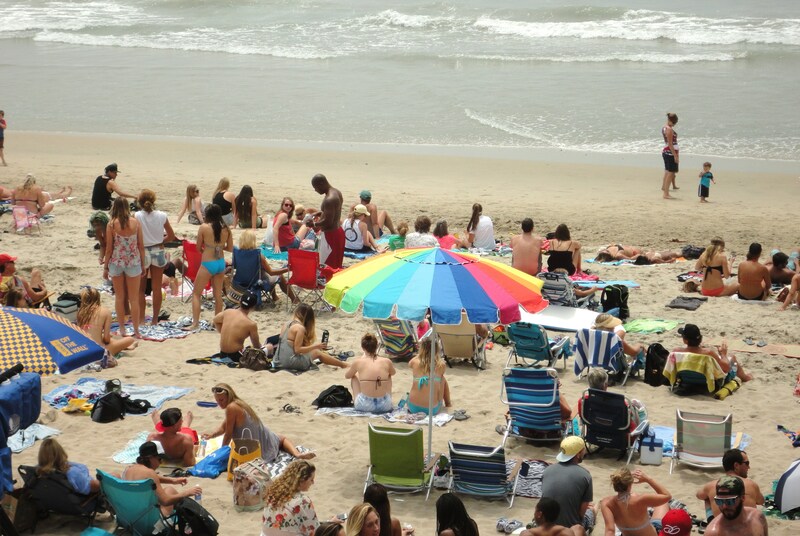 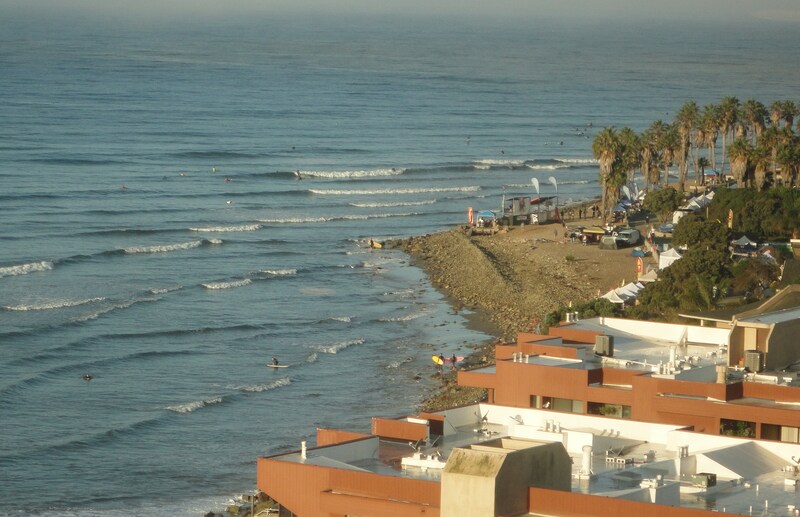 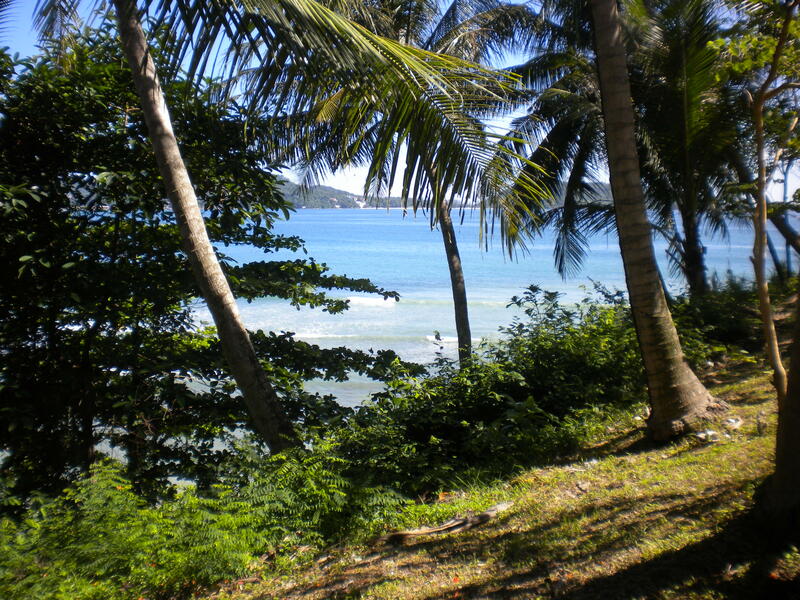 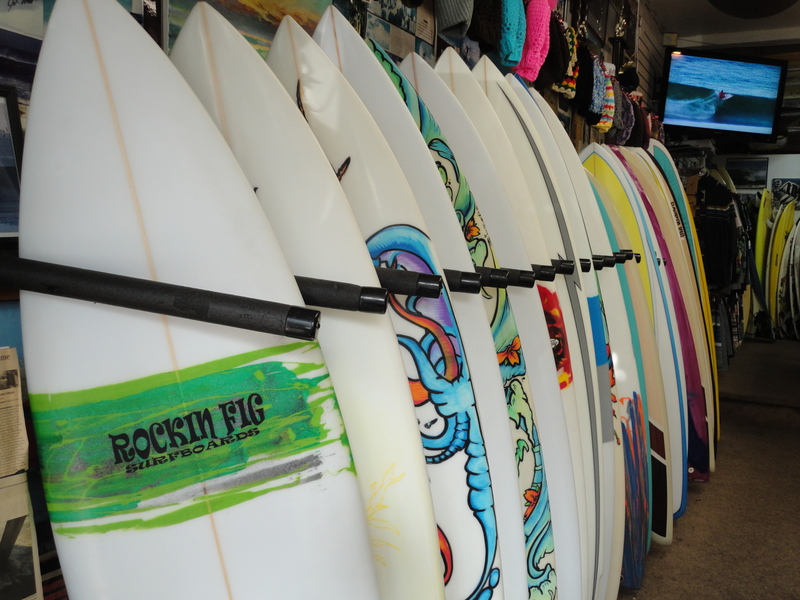 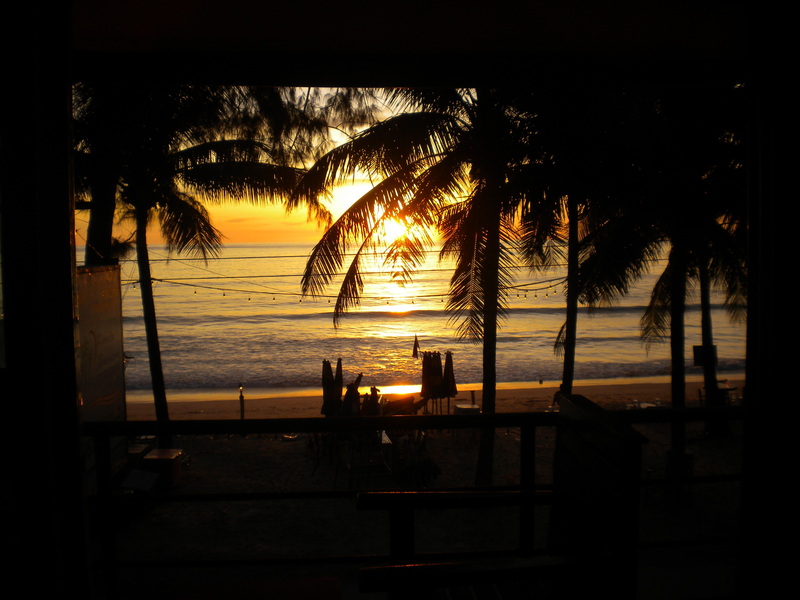 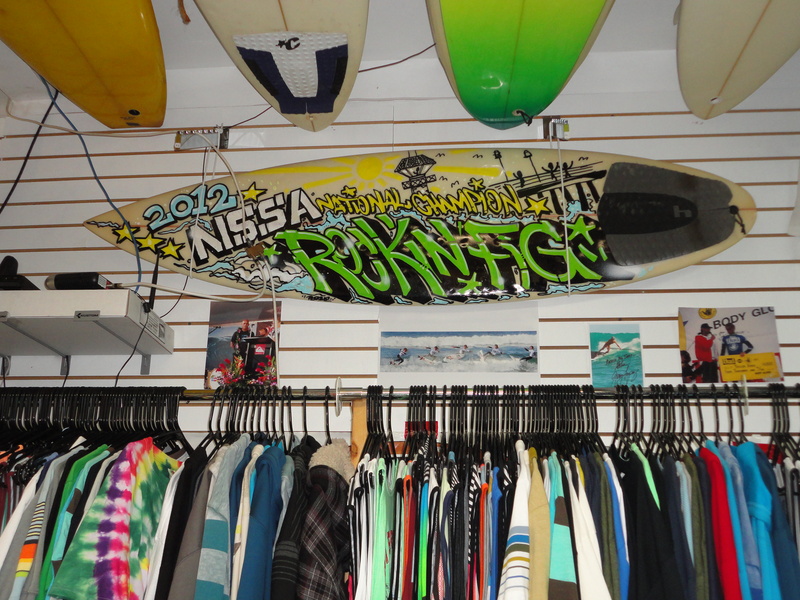 Fig has made the Rockin Fig surf shop more than a place to find boards and accessories. 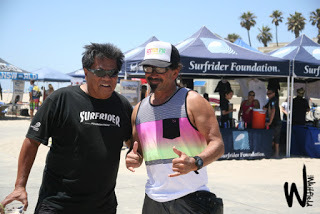 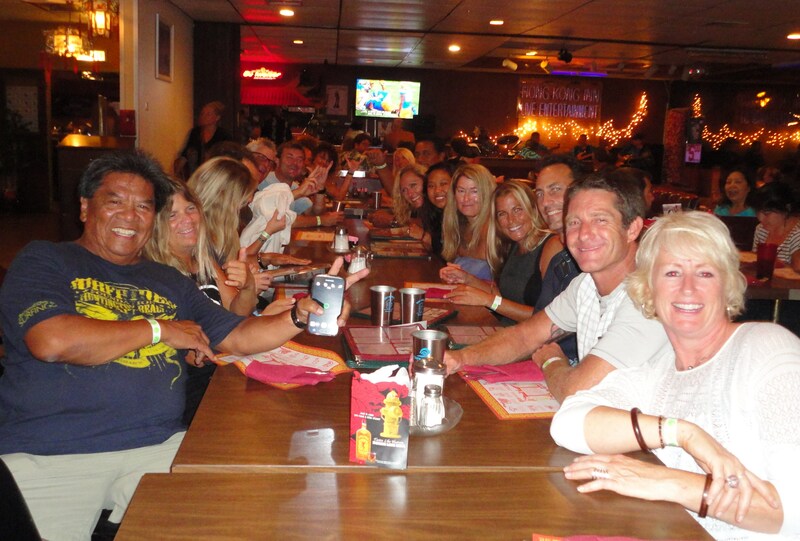 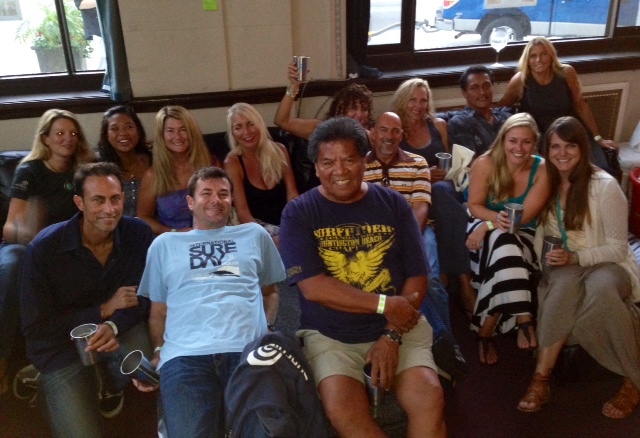 It’s a meeting place where everyone from beginning surfers to surfing legends can stop by to share stories and talk about the sport they love. 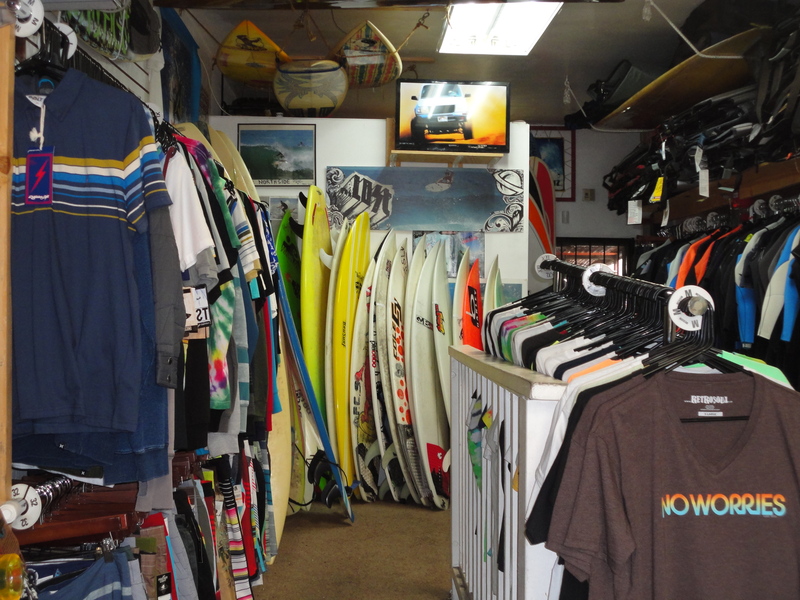 If you’re lucky enough to be in the shop on a day that Fig is there get ready for a warm welcome and a chance to learn a lot about surfing. 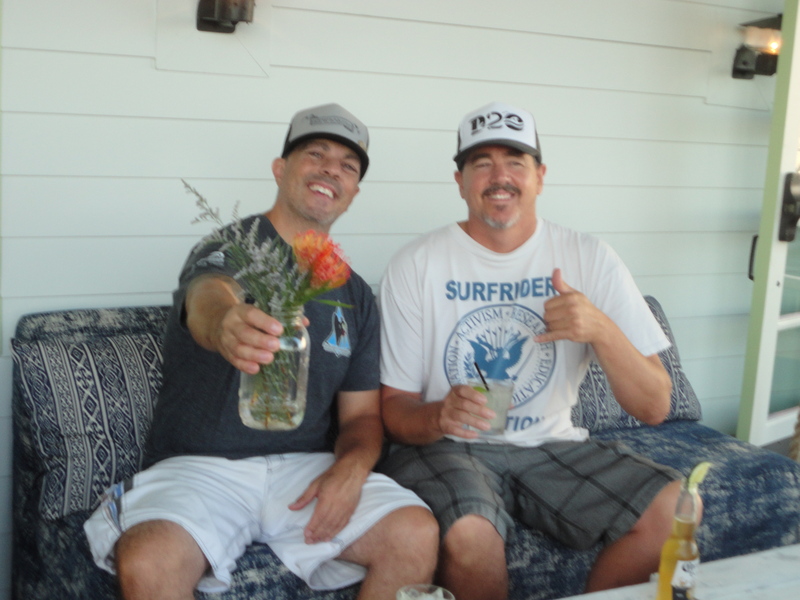 Just being around Rockin Fig will put a smile on your face. 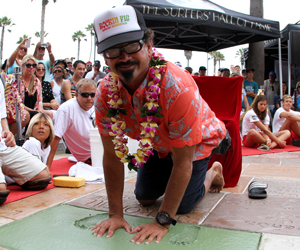 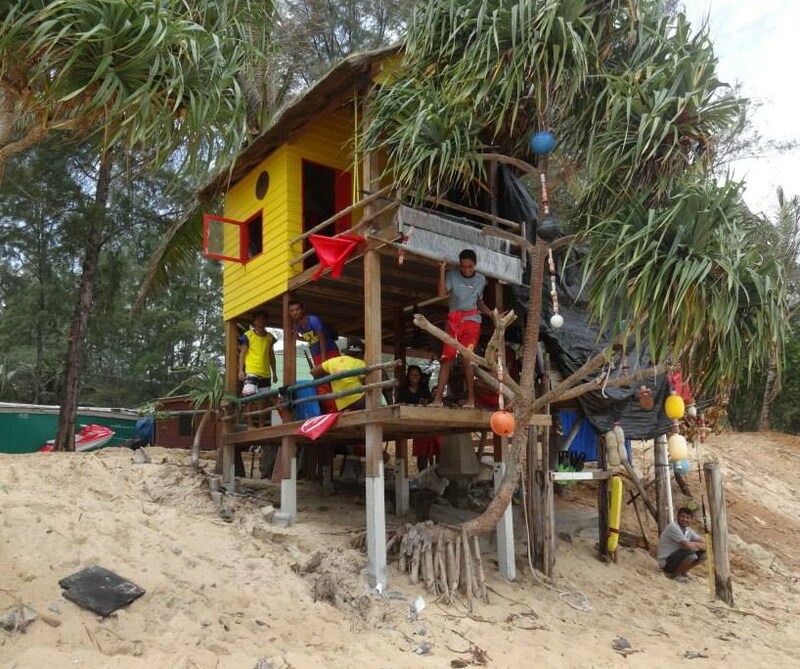 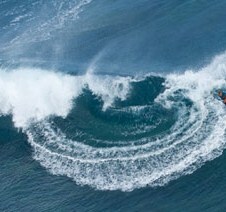 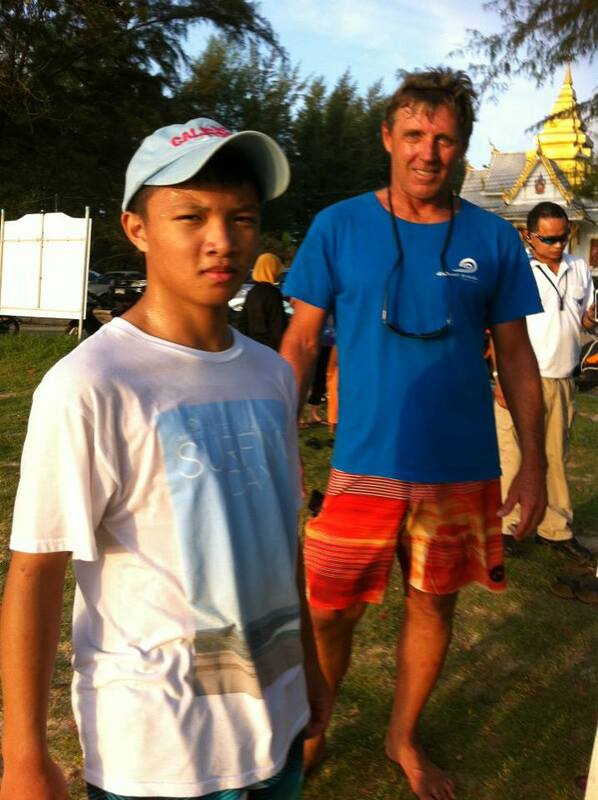 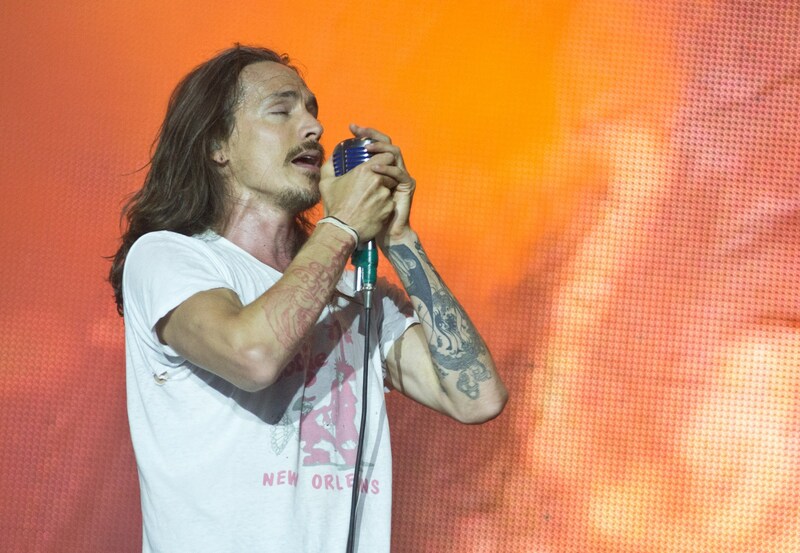 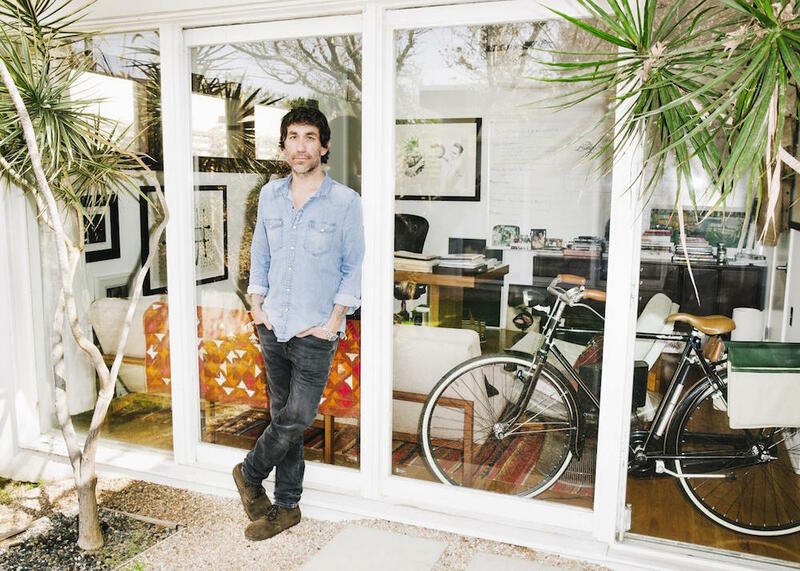 For someone who’s in the surfing stratosphere, it’s surprising how down to earth he is. 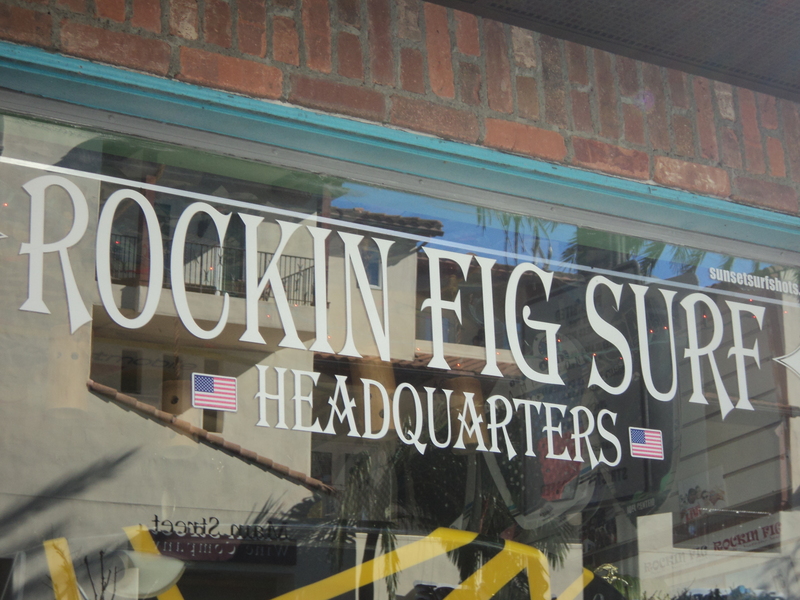 In an age when so many celebrities seem superficial and manufactured by the media it’s clear that Rockin Fig is the real deal.